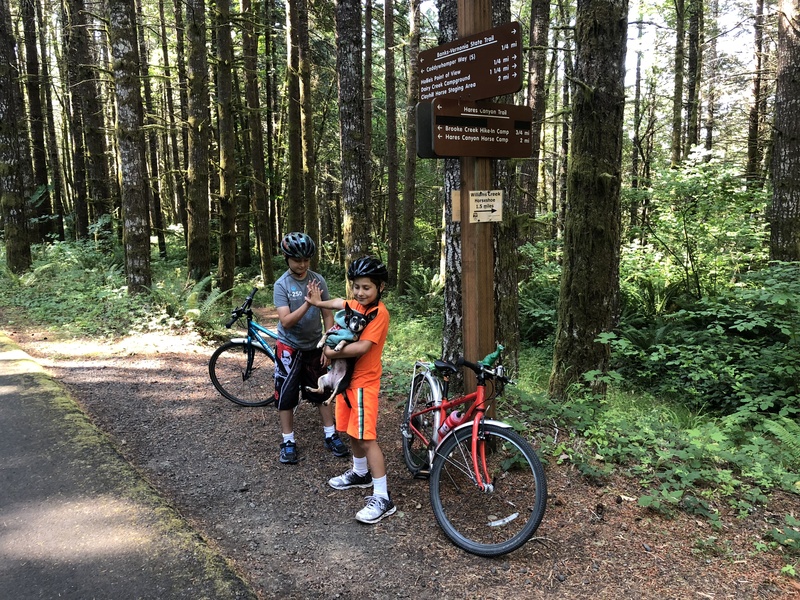 We took our first family bike camping trip from Portland — to LL Stub Stewart State Park — and it was amazing! It’s farther away than we’re used to going for camping, even with taking the MAX light rail train, but at least it was much less hilly than any of the camping in the Seattle area. Also, it was all GORGEOUS! 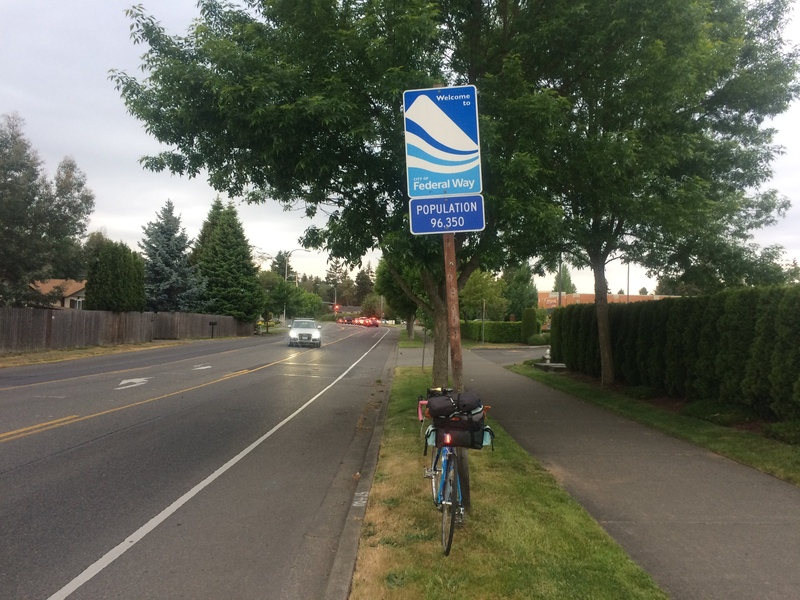 Taking the blue line to the end of the line in Hillsboro allows one to avoid the west hills, lots of not-fit-for-family-biking roads, and saves 25 miles. 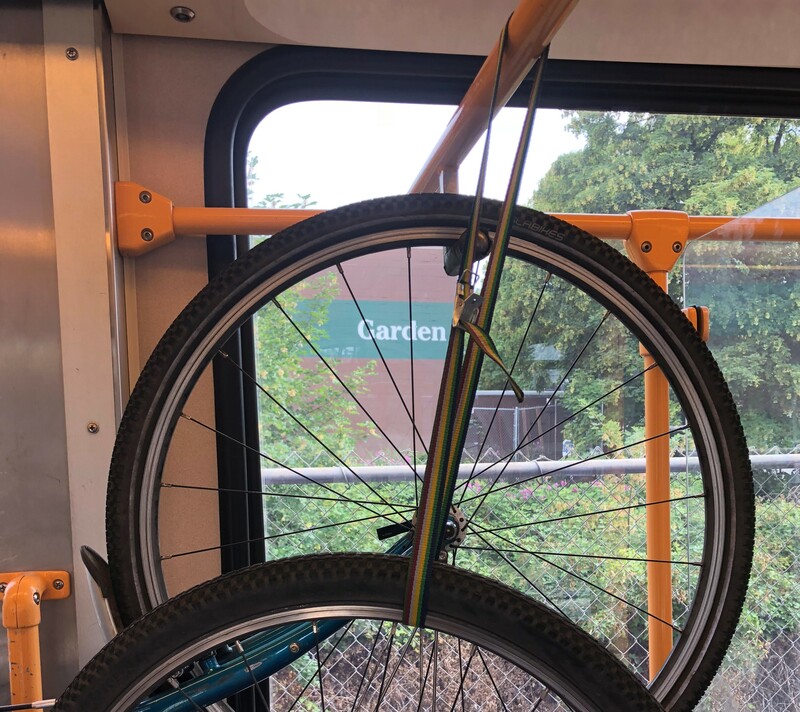 Initially I wanted to bike to the blue line station closest to us (six miles to Gateway on the I-205 bike path with only minor ups and downs), but in the end I decided less tired kids was worth the hassle of putting bikes on and off two trains. 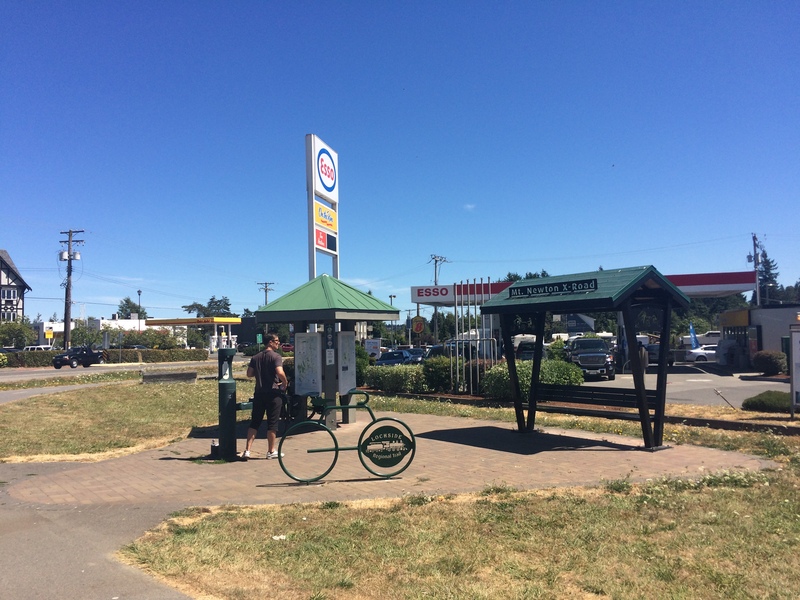 We biked two flat miles to our closest MAX station and caught a train for nine minutes/five stops to Gateway. Now I know we can get off the left-facing doors and not even need to cross the tracks to catch the blue line, which we rode for 1:14/34 stops. We haven’t taken such a long MAX trip before and it was nice to have time to settle in and hang up all the bikes. I learned from the comments of my Family Biking: Taking kids and bikes on MAX light rail article on BikePortland that people bring big S-hooks along with them to hang extra bikes. Our local hardware store didn’t have one large enough, but a cargo strap did the trick! I hung the kids’ bikes on one side and mine on the other. Cargo bikes aren’t allowed on the MAX so I had to take a regular bike. As luck would have it, I recently made some changes to my “me” bike, a Surly Straggler. (Me in quotes because its rear rack is a Burley Moose Rack to which I can attach a Burley Piccolo trailer bike. I don’t do this often, though, since that only carries one kid and they tend to both want to be carried or neither be carried.) 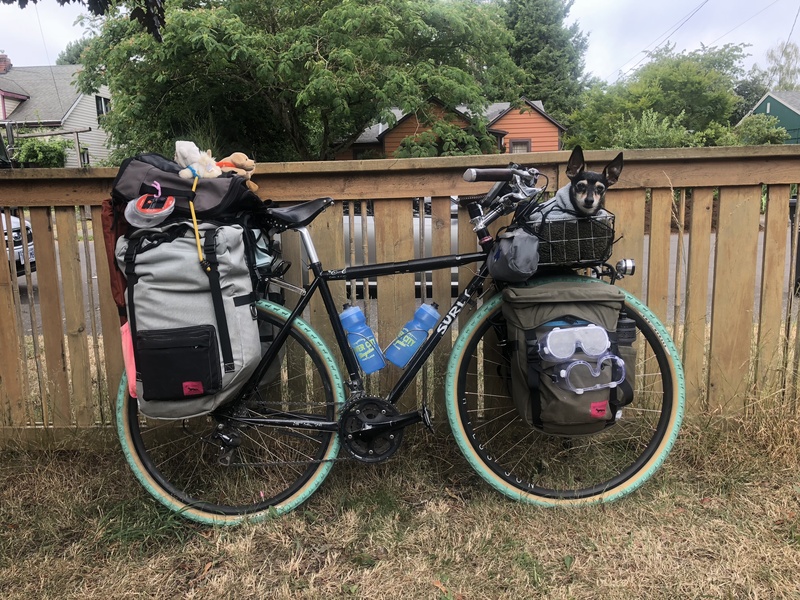 I swapped out the slick tires and fenders for knobbier gravel-friendly tires (the old tires were gravel friendly, too, but these ones are more gravel friendly) and I added a front rack so now I can carry two panniers in the front in addition to the two panniers in the back. 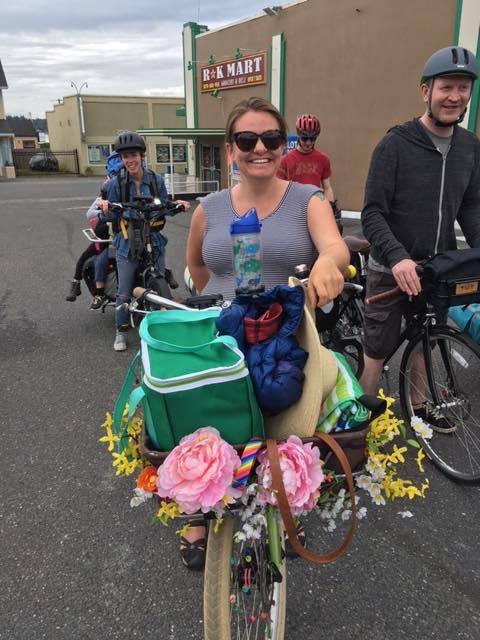 I’ve taken this bike camping once before, the second time we went to Manchester State Park so I could more easily fit in the elevator between the big ferry and the foot ferry, but that was before the front rack so I had to wear Pixie in her backpack and use the front basket for gear. This time I was able to leave Pixie in the basket and put all our gear into the four panniers. I added a fifth bag wedged in between the rear panniers full of our snacks, and rested Pixie’s backpack atop that. We didn’t end up needing to use the backpack for Pixie at all, but it worked well to discard our layers into and to put the speaker inside, facing the kids behind me through the mesh so they could hear their music more loudly than I had to. 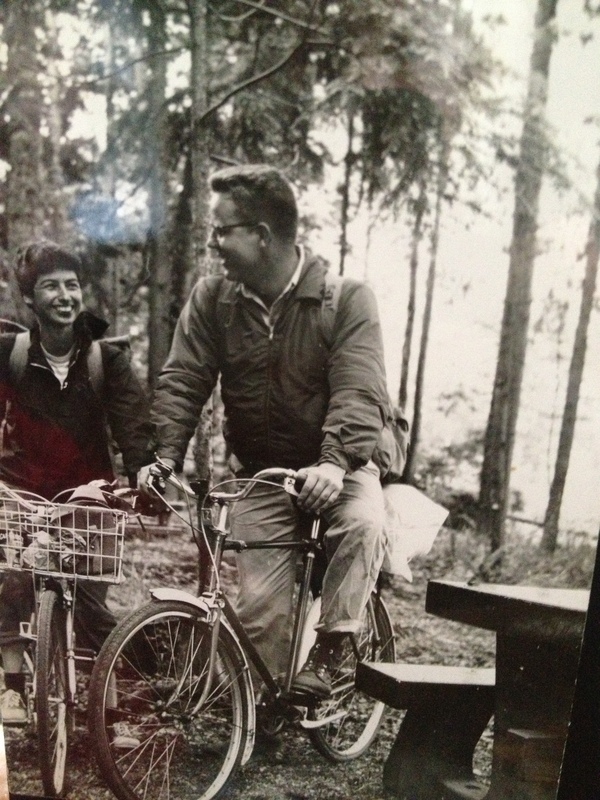 My family biking friend (my first family biking friend! 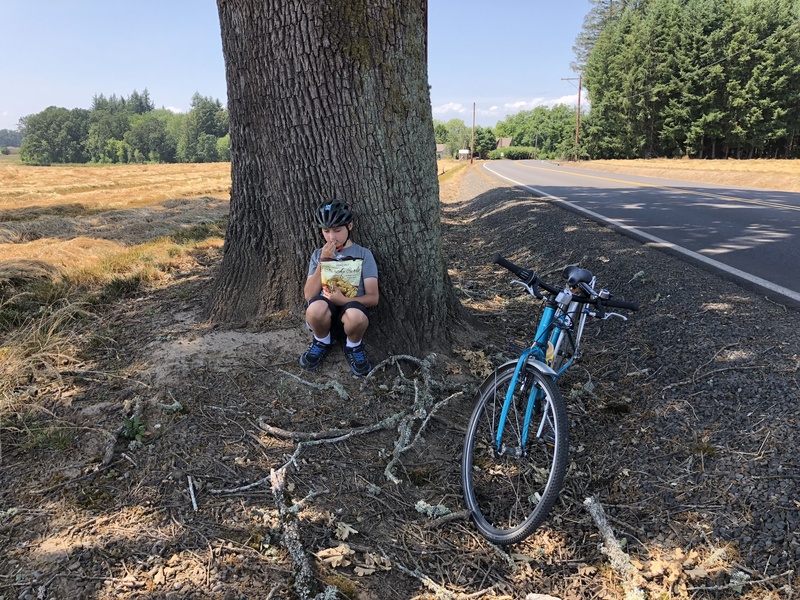 ), Andy, gave me the route to take from the MAX station to the trailhead, 12 miles of the most family-friendly route from Hillsboro to Banks. 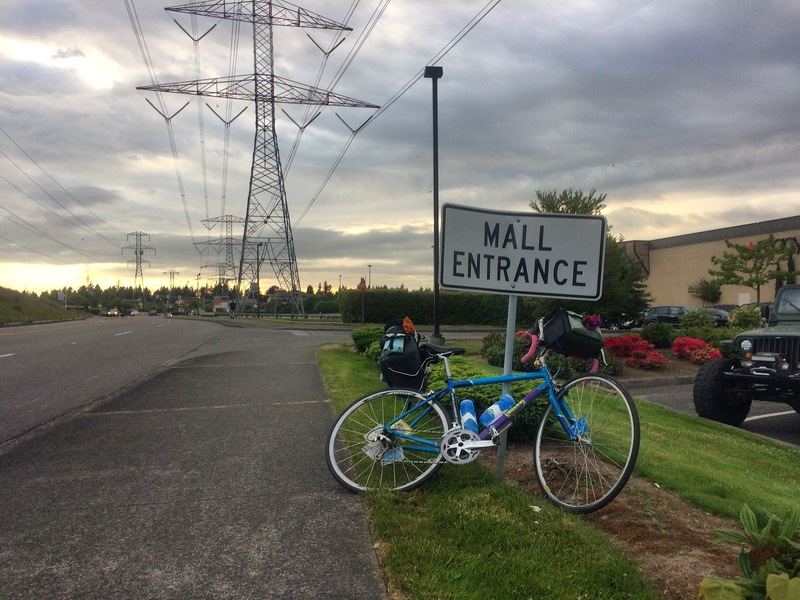 Here’s my Ride with GPS Hillsboro to Banks route with some added notes and points of interest. Our trip was on the 4th of July and we noticed the tail end of a parade through the windows of the MAX as we approached the end of the line. That made for busier-than-normal streets in town, but everyone was driving slowly. 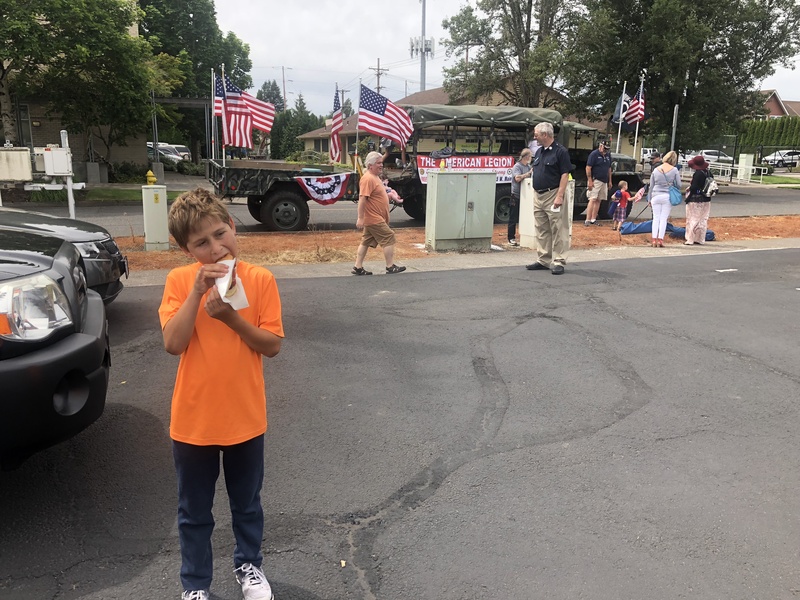 It also meant free hot dogs and cookies thanks to the American Legion a block from the MAX station! 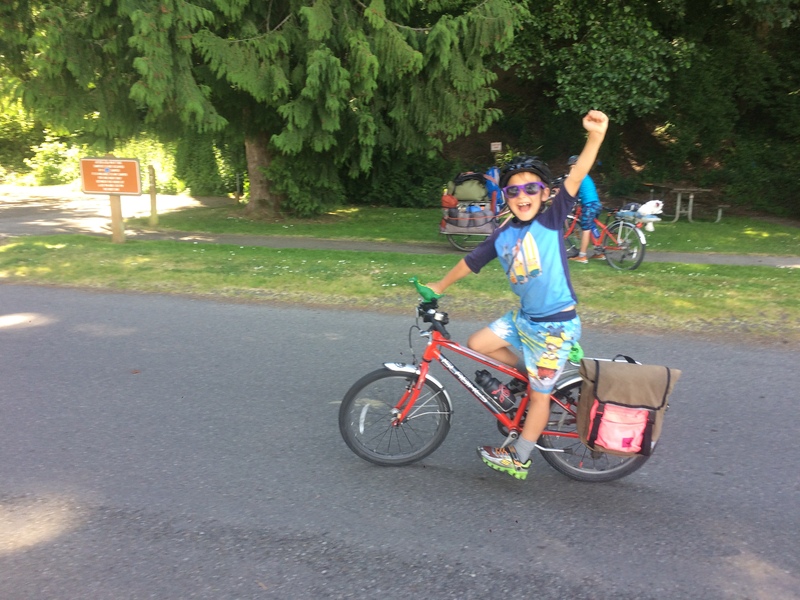 Fueled by free hot dogs, the kids we able to bike 12 miles without stopping. We left home at 9:30 (I had hoped to leave at 9) and departed the hot dog stand at noon with the temperature still nice. We soon got into the lovely farmland. Our camping near Seattle is just so different than this! 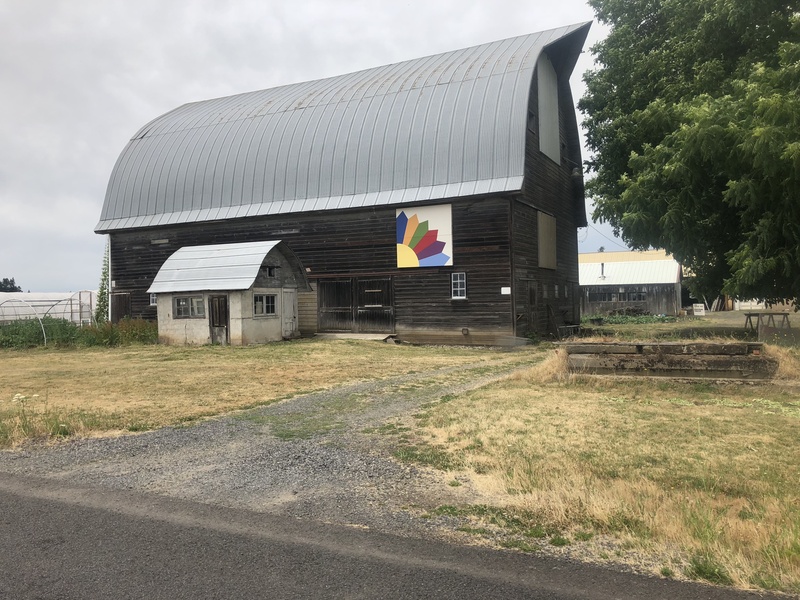 I’ve biked through areas like this once, when I biked down to Portland with a friend a couple years ago (photo album here), but seeing it with the kids was so fun! They probably got bored of me shouting, “Isn’t this just so pretty?” but I couldn’t help myself. There was a quarter mile of a fast-moving highway with a wide shoulder, but we had no trouble turning onto and off of it and traffic was moderate on that road and minimal everywhere else. It’s hard to know if the light traffic we saw on the country roads was normal given the holiday, but it wasn’t too much busier the following day as we headed home. The half mile of gravel about 3.5 miles into the trip normally would have been fun for the kids, but my younger son had to stop and scratch at itchy palms a couple times. He wants bike gloves for next time. Letting some air out of his tires on the way back helped, but then he had to endure me fretting aloud about pinch flats. The road into Banks was a fast one, but again it wasn’t very busy this day. We immediately passed a Thriftway grocery store tucked behind a gas station, which we’d stop at the following day. Our waters were low (I brought five water bottles) so we kept our eyes peeled for parks with drinking fountains. Having the dog along means we don’t plan on stopping at stores or restaurants. I saw a drinking fountain by the Sunset Park baseball fields to our left so we pulled into there, only to discover the drinking fountain was broken and the park doesn’t allow dogs (per a sign, not per getting kicked out). However the restrooms were some of the nicest park restrooms I’ve ever seen so it wasn’t all bad. 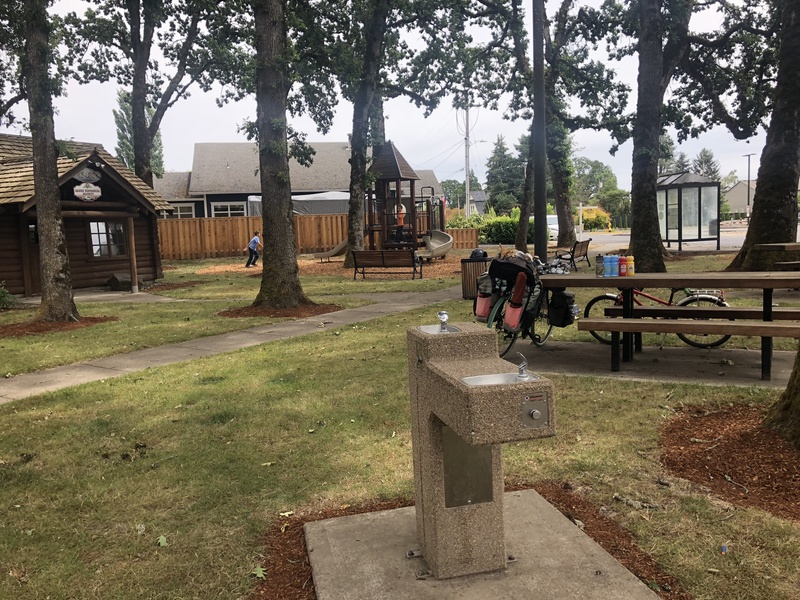 We continued along and discovered a working drinking fountain at cute, little Log Cabin Park where we stopped for a long snack and rest break. 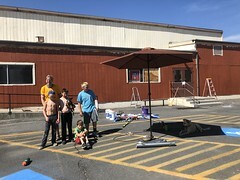 The kids said the play structure was too small for them and there was no restroom (there was a locked portapotty) so it’s not an end all be all park, but between the two stops we covered our bases. From the City of Banks Parks, Recreation, and Trees webpage I see there’s one other park, Greenville City Park, but in Google Street View and Google Satellite View it doesn’t appear to have a restroom either. Next time we might stop at a kid-friendly restaurant with outside seating. 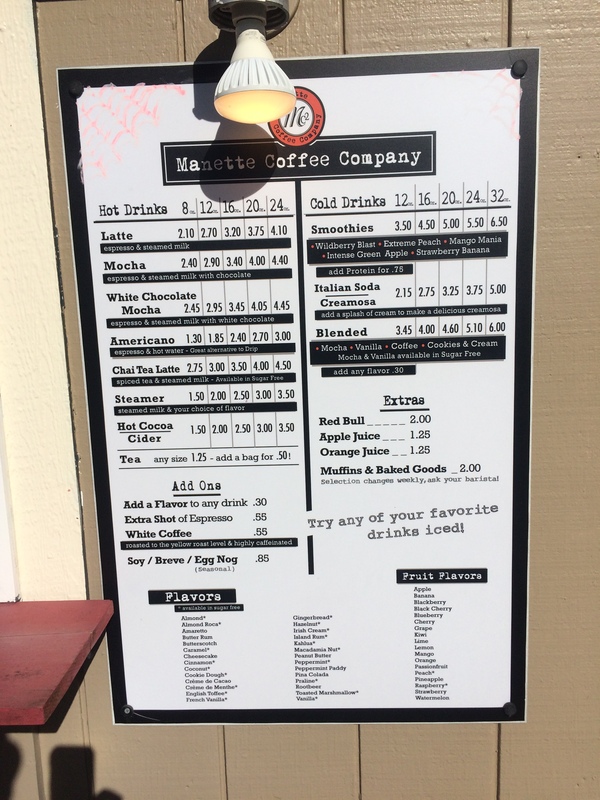 Bike-themed Trailhead Cafe looks like it would be perfect, though it’s closed on Sundays. Had we not found water and restrooms on our way through Banks, the trailhead had it all! 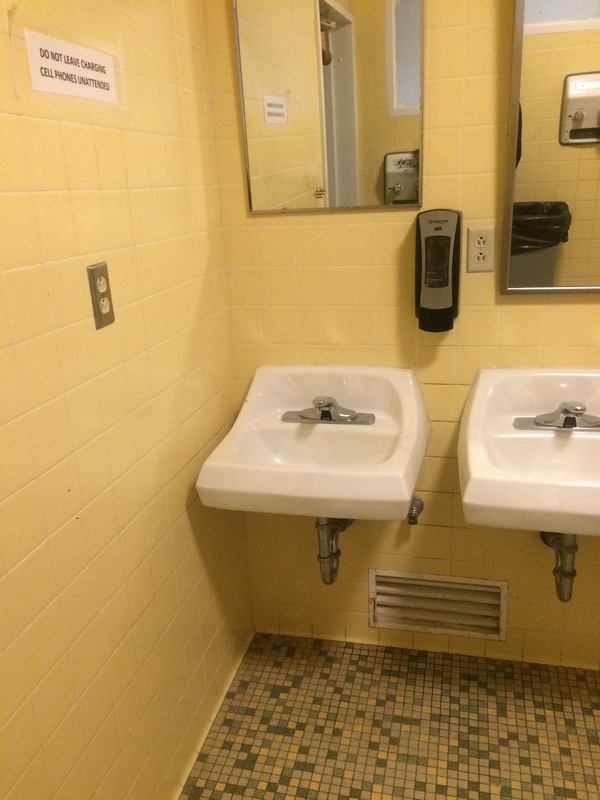 Drinking fountain, restrooms, bike repair station! But also lots of people arriving from two parking lots so it was nice to have hung out in the shady playground by ourselves beforehand. Just next to the trailhead is Banks Bicycle Repair and Rentals which I think was affiliated with a sign I saw advertising pie. That would be worth investigating! 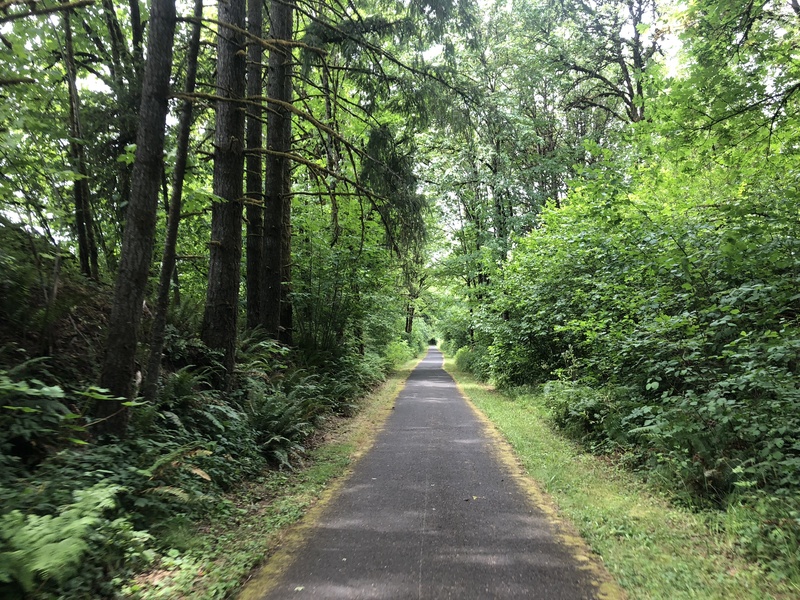 The Banks-Vernonia State Trail is AMAZING! We took the trail for 10 miles, but it continues another 10 after we got off. It starts out flat and forested (we even saw a couple bunnies on our way back!) 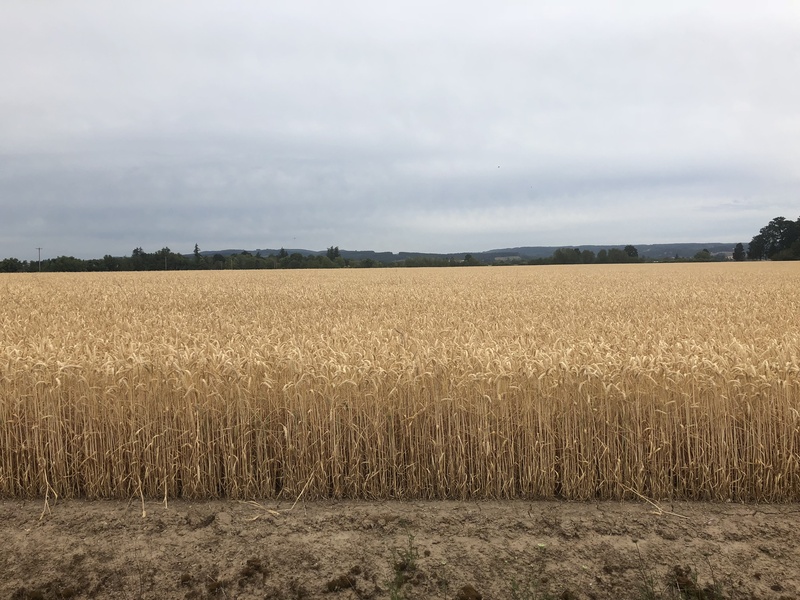 and opens up to flat and farmlandish (we saw a hawk intently circling prey in a wheat field). There are several small wooden bridges with slight bumps to get on and off — all marked with orange spray paint, as are any other bumps in the road. Halfway into our ride the trail started climbing, but it’s a gentle “railroad grade” so the kids didn’t mind. And I was happy knowing we’d have a downhill ride back the next morning. We mostly saw people on bikes, but there were also some runners. One of the parking lots along the way was for people with horses and we saw evidence of horses having been on the trail, but no horses in the flesh. Our 10 miles had one big gorgeous wooden bridge, the Buxton Trestle. It reminded me a bit of the trestle bridges along the John Wayne Pioneer Trail out of Seattle. A sign soon alerted us we had entered the park, even sooner than we expected to! But we still had a bit of a ride before the turn-off to camping. We also biked by a sign pointing towards mountain biking. That might be fun to incorporate into a multi-day visit, assuming there’s some beginner stuff. Right around the horse parking lot we bumped into a friend who warned us about the switchbacks leading into the hike-in camp area. That proved helpful because despite the sign indicating the dirt trail turn-off from the main Banks-Vernonia State Trail, I would have worried “bikes don’t belong here!” and possibly backtracked looking for a different entrance (which does indeed exist, though it’s not any better). The first switchback was too steep for me to bike up and also too steep for me to push my bike up alone so one of the kids parked his bike and helped shove from the back. The second switchback and last switchback were also too steep for me to bike up, but I could push alone. The dirt devolved into fairly big rocks (big compared to gravel, that is) embedded in the ground with grass growing around them. It made for a bumpy but doable ride. It also made us want to compare the other entrance so we rode to that the following morning. 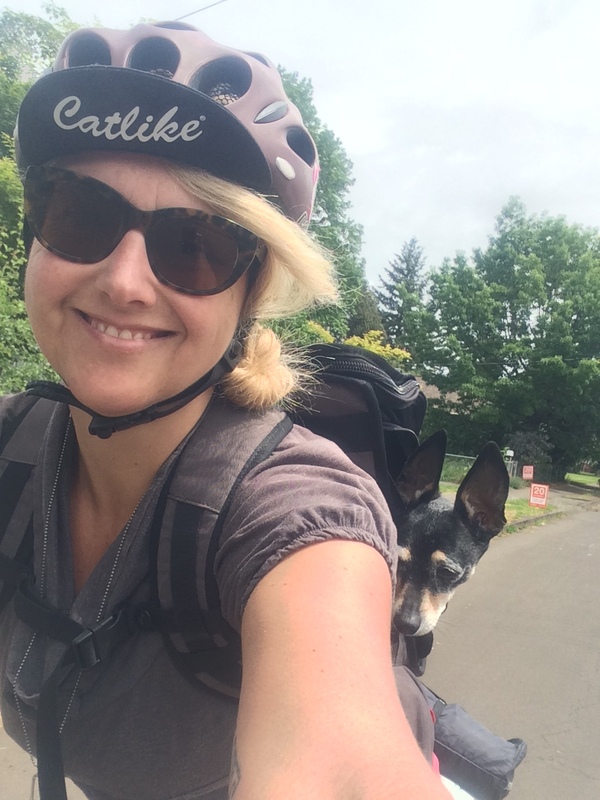 We biked (without gear, yay!) to the visitors center to see the entrance the drive-then-hike-in campers used. The gravel was more straightforward, but it was a big downhill and then a big uphill. I was glad not to test it with a loaded bike, but that means I can’t accurately compare the two. I think I would have had trouble pushing my bike up this hill and we’ll stick to using the switchbacks. Wheelbarrows are available for people to bring gear from their cars, which reminded me of Ruckle Park on Salt Spring Island, but this was better since we didn’t need to bike through the parking lot and hadn’t been near cars for hours. There are car camping spots, but those were $22 and the hike-in was $11. I also heard there was better tree coverage for shade at the hike-in sites. Turns out those trees were also good for rain coverage. It started drizzling as we hit the switchbacks, which felt great, but didn’t touch us much thanks to the trees. We also stayed dry at our site when the rain got a bit heavier. There are also cabins that seem very popular, but those probably fill up more quickly and cost even more. I have no idea where the cabins and car sites were in relation to our hike-in area. I chose site 20 to be close to one of the two restrooms, but not close to one of the two fire pits. I figured we’d want to go to sleep earlier than the people at the camp fires, but it’d be nice to visit and roast marshmallows earlier in the evening. And it was! We hung out with grownups with two dogs and then with three kids who’d been camping for a few days already and were excited to finally have some kid company. 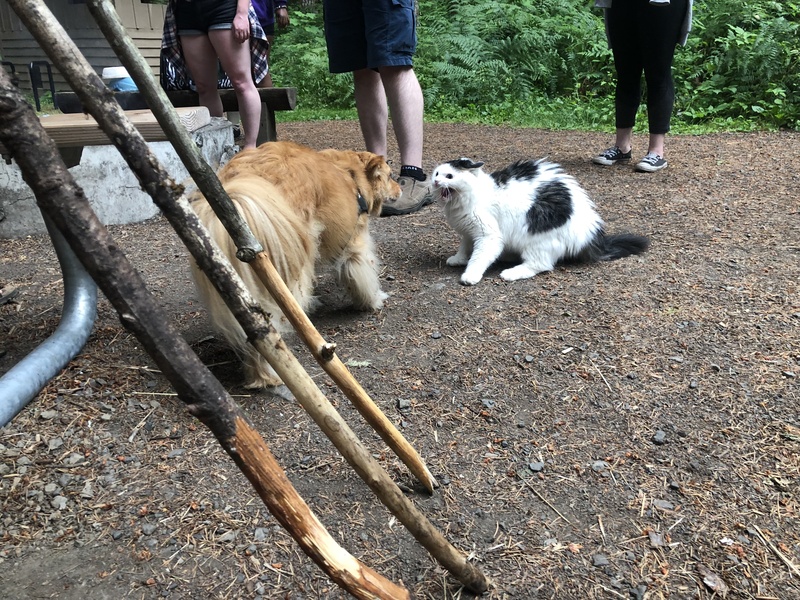 There was even a cat camping! There were a lot of mosquitoes and the rain didn’t chase them away one bit. I had spray with us, but next time I’m bringing mosquito lotion to better slather on. Also next time we might brave a site by a fire. The campfire we made our s’mores at was right next to a grassy field, a restroom, and water so it had everything! But the other fire pit has a cute cluster of sites around it…though not being near a restroom doesn’t appeal to me as much. Our morning bike ride to the Visitor Center brought us by the self registration station and the activities calendar. Full of fun stuff! We hit the road at 9:55 (I had wanted to leave at 9:30) while it was cool and shady. 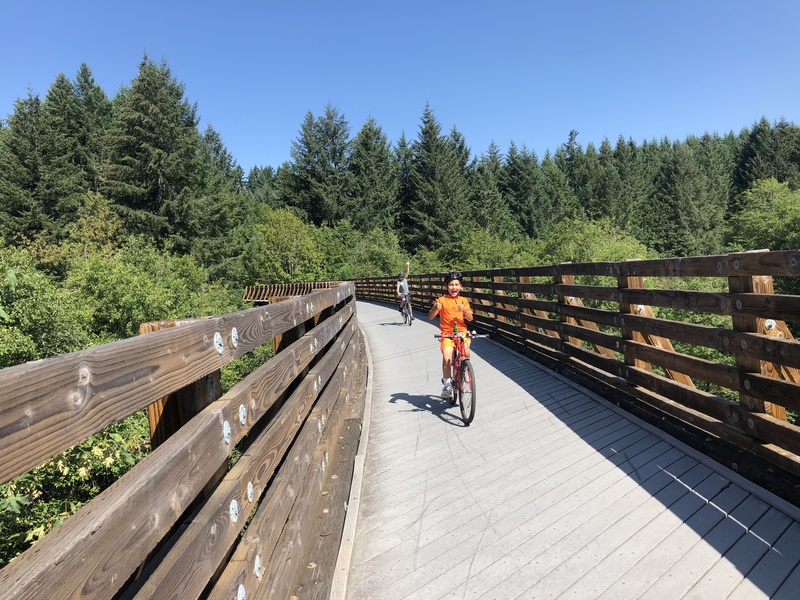 After quickly navigating the switchbacks in the downhill direction, the Banks-Vernonia State Trail was also a quick downhill adventure. My younger son had a very sore loose tooth and I hadn’t thought to bring any sort of medicine (or bandaids even!) so we stopped at the Thriftway for Children’s Advil. Several people bade me “Be careful!” out front of the store so I returned the blessing. 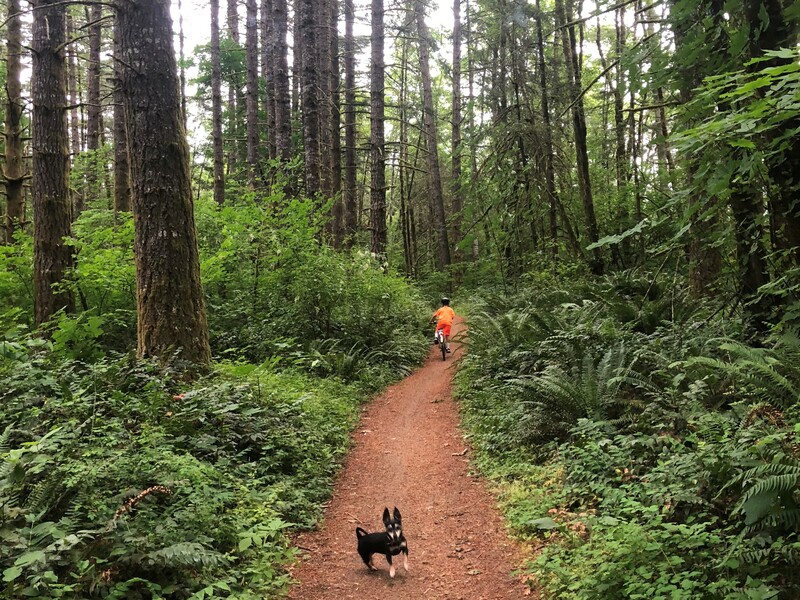 It was disconcerting after having been around so many cheerful people walking, jogging, and riding bikes to encounter this worry as soon as we were just a little bit away from the trail. I might try to stick to Main Street in the future. I don’t think it was hotter than the day before, but we were all tired and needed to stop more for water, snacks, and rests. Some of our stops were in shady spots, but some were exposed. I guess the thing about riding through the countryside is that there aren’t a bunch of playgrounds along the way. But it worked well enough. During one extended snack break in a shady spot at the edge of a field we oohed at numerous little twisters that flung dry grass around and watched a tractor putter by. 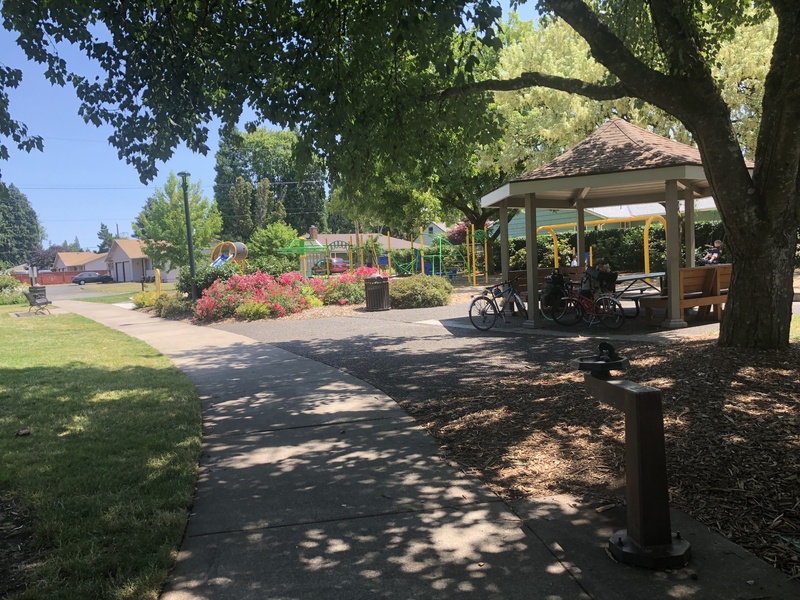 Once in Hillsboro we stopped at McKinney playground for a very long play break even though we were almost all the way to the MAX by then. The park has restrooms, drinking fountain, sheltered picnic table, and lots of grass. The kids complained that there weren’t other kids their age there, but they found the play equipment adequate. 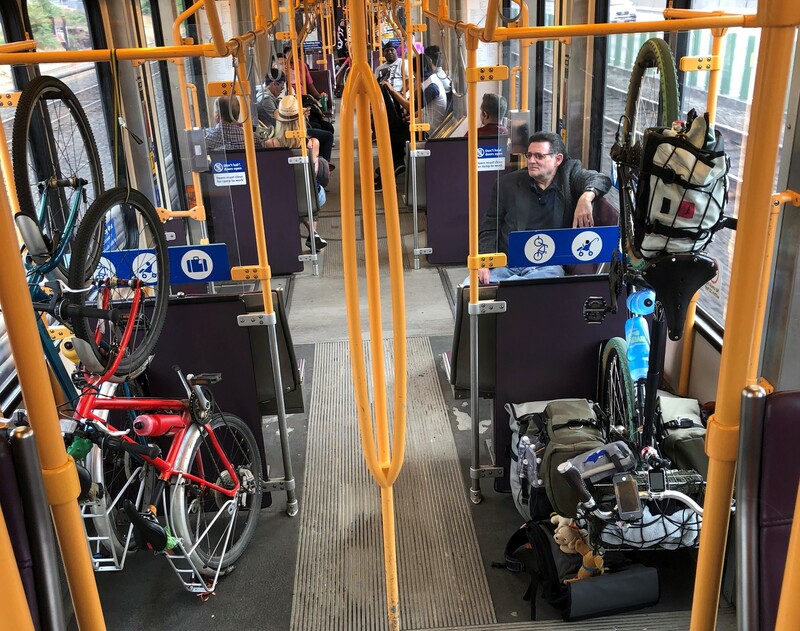 It was nice getting on a parked light rail train at the beginning of its line as I had plenty of time to hang the bikes and get us settled into seats. However, getting off in the middle of the line this time was not as fun. 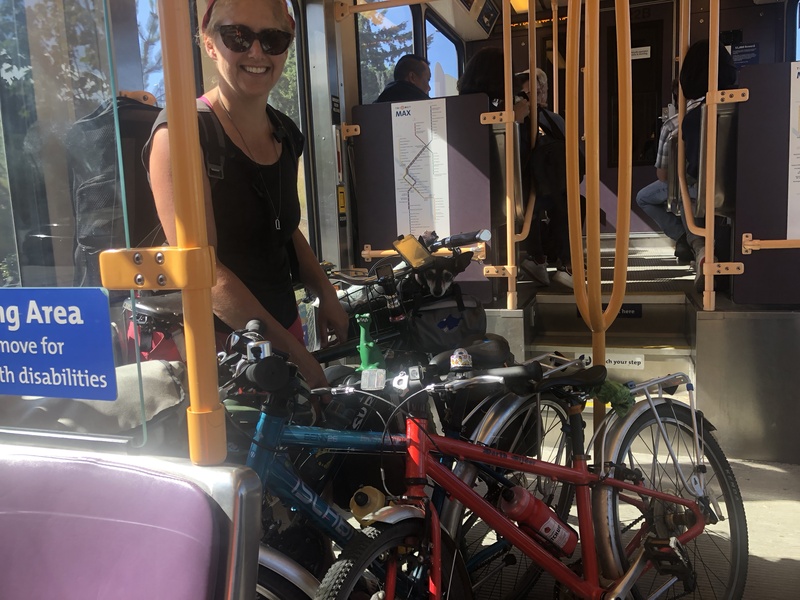 The train was pretty crowded and I didn’t realize how short the time after the penultimate stop was so I tossed panniers out the door after the kids before unhooking my own bike. I warned the kids that if the second train was too full for bikes we’d have to bike all six miles home, but there was room for us. Phew! I don’t think any of us would have liked biking six not-perfectly-flat miles. Since this was the nine-minute ride I just stood with all three bikes while the kids sat down. And soon enough we were home, just about seven hours again from flap to door. * Log into the Trimet Tickets app at home in the morning! I purchased our MAX tickets on my phone the night before our trip and it usually doesn’t ask me to log in, but I discovered I was logged out at the MAX station. So I had to purchase new tickets from the kiosk on the spot. The app tickets are still there for future use, but I was looking forward to not having to dig out my wallet, not having to worry about paper tickets falling out of my pocket, and not having to waste time buying tickets on the spot (though it didn’t make us miss any trains). * Camp two nights next time! Having a day to play and rest next time will be fun. I don’t know that we’d go mountain biking, but not biking 20 miles two days in a row sounds good. We didn’t see any swimming this trip so that’d be something to look into. * Leave earlier and/or stop less on the way back so we don’t have to take the MAX during rush hour. * Bring two tents? We all fit in an REI Halfdome 2+, but only if I put my head by the kids’ feet. This is fine when we’re on flat ground, but when we’re on a slope it means my head is downhill and that’s not so fun. I didn’t sleep very well this time. My older sun got his first bloody nose (a real gusher!) as soon as we lay down to bed (I think brought on by his being too hot?) so we slept without the rain fly on for the first time. Thus my younger son got too cold in the middle of the night. They say you’re always supposed to camp for two nights since no one sleeps well the first night, ensuring great sleep the second night. I know if I had my own tent I’d sleep well both nights. I’m just not so sure the kids would ever go to sleep. And Pixie might have trouble choosing a tent and staying there. But there’s only one way to find out! 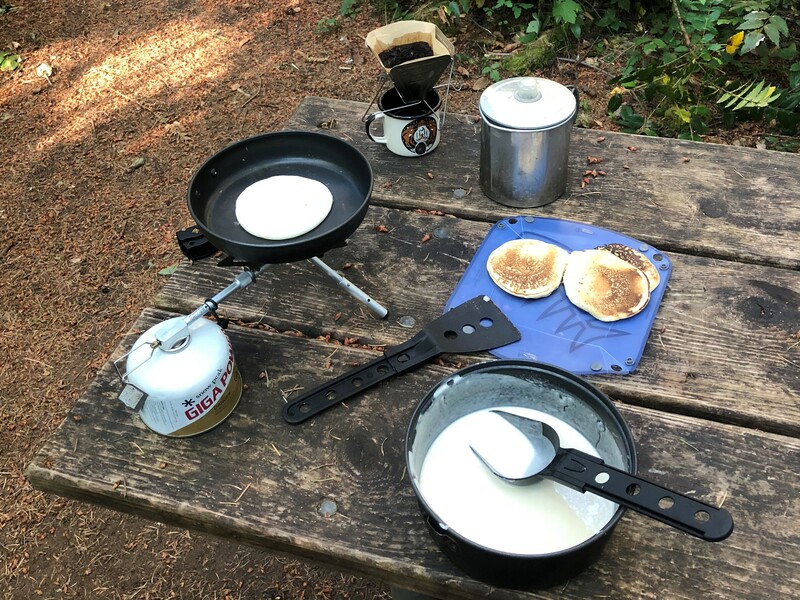 * We tried a new brand of just-add-water pancake mix (we usually do oatmeal for camping breakfast) from Birch Benders I got at our local New Seasons Market and the kids both liked them. I measured out the batter and water at home so I wouldn’t have to bring a measuring cup along and that worked well. For two breakfasts I’d probably bring the whole pancake mix container and not pre-measure a small container of water, though. That would save some room there! We love Stub Stewart and can’t wait to come back! I found a new bike camping spot near Seattle! 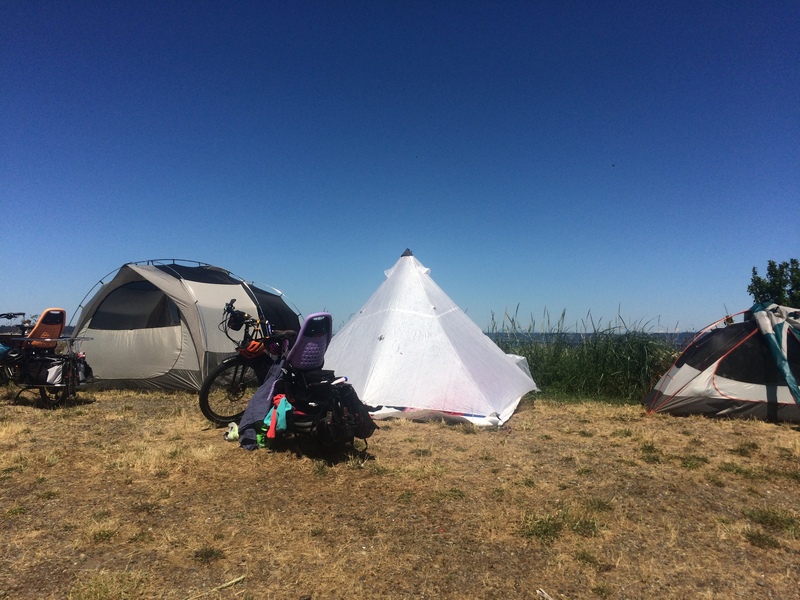 My full trip is posted on my Ride with GPS Ride Report: Bike camping at Dash Point State Park, but since day one could work well for a family (reversed to get back) I’ve got it on the blog here, with some extra kid stuff thrown in. 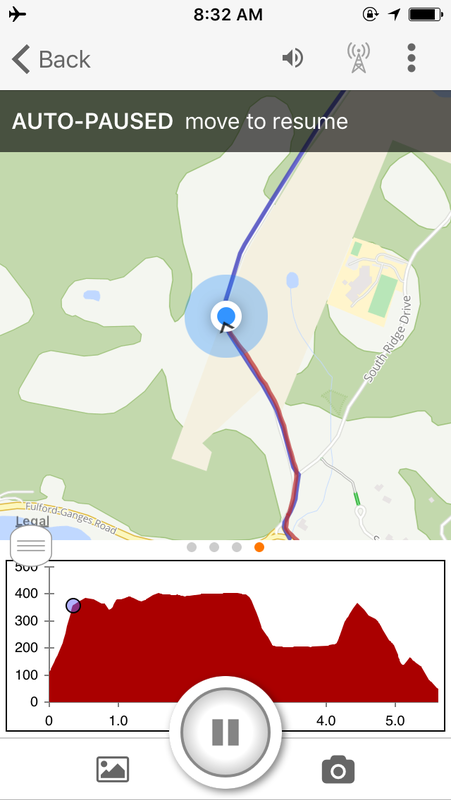 Here’s my Ride with GPS recording of the trip and my Strava recording of the trip. Once a month I deliver my kids to Seattle via Amtrak train so they can spend some quality time with their dad. Lately we’ve been leaving early enough that I can catch a train back home to Portland the same day. 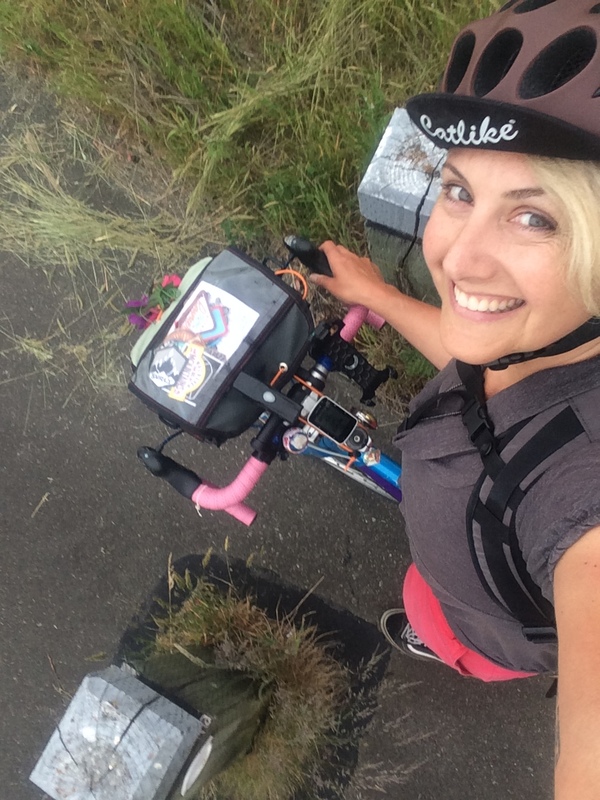 For these trips I carry them the eight miles to our train station on my cargo bike and leave it locked with every lock we own until I come back to it at night. When we haven’t been able to travel early enough for a same-day train I’ve brought a bike along and stayed at a friend’s house, but no one was staying in town for the three-day weekend. My friend invited me to stay at her house even though she’d be away, but that didn’t seem as fun as having her home (and to tell the truth, she lives around the corner from our old place and I wasn’t eager to climb my old hills now that I’m a grateful flatlander). I had the bright idea to camp overnight, but all my familiar spots didn’t seem to fit the bill very well. 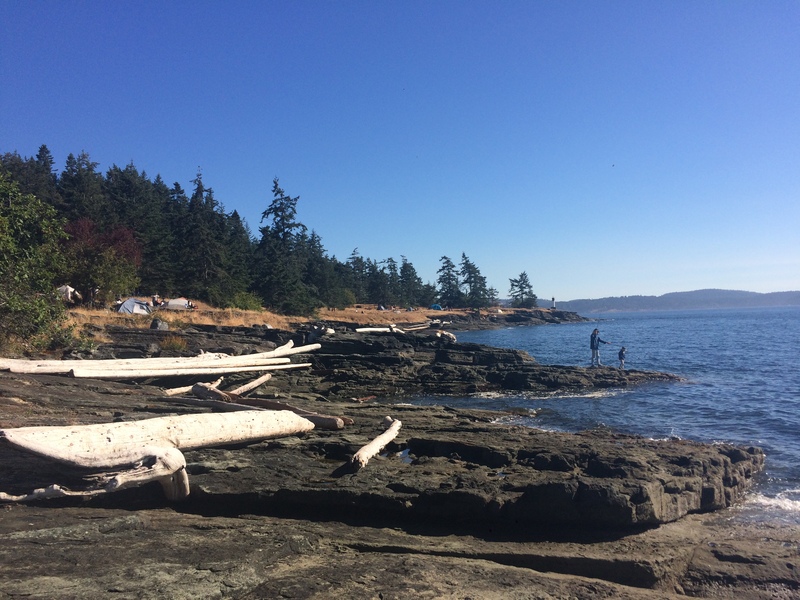 I love camping at Fay Bainbridge Park with the kids — the beach, play structure, and summer owl show are awesome. But without kids it can feel like a parking lot. 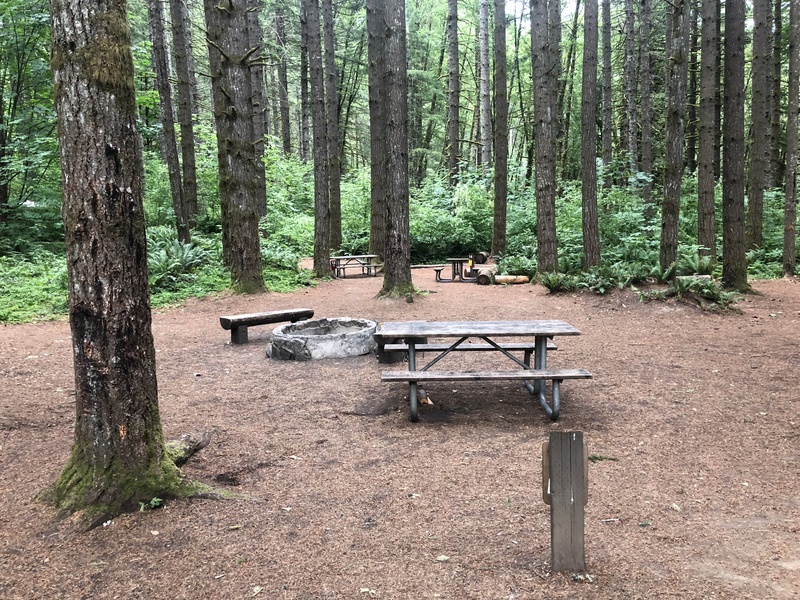 And Illahee State Park Campground is closed for sewer repair work (and the Illahee Hiker/Biker sites are closed indefinitely for renovation). Manchester State Park, like the other two, relies on a ferry ride which didn’t seem like something that would pair well with rushing to the train in the morning. A non-ferry spot close to Seattle I’d love to camp at someday is Tolt MacDonald, but it seemed quite far from the train station which led to my idea to check out campgrounds close to one of the next couple stations down, Tukwila or Tacoma. Enter Dash Point State Park! I had to bring a bus-friendly bike to begin with, so I could bus with the kids to the Portland train station so I decided that rather than bike three hours to a new-to-me campground and arrive after dark I pedaled just a few blocks from Seattle’s King Street Station to catch Sound Transit 578 Seattle to Federal Way/Puyallup. Most Seattle buses have three slots on the bike rack, but the tour bus style Sound Transit coaches — like the 578 — only have two. One slot was already taken so I made it on the first 578 to arrive, phew. Otherwise I’d have had to wait 20 minutes for the next one. I’m not sure how to tell if a Sound Transit bus is a double bus with three bike slots or tall bus with two other than by looking it up in Google image search. Once on board my bus ride was one stop/30 minutes to the Federal Way Transit Center. If I were to do this with my kids, I’d need to be on my Brompton folding bike and carry it inside the bus (which holds more than my road bike anyway!) so we could fit their two bikes on the bus rack. We’d probably consider catching the bus upline, too. The bus let me off next to a big shopping mall, The Commons at Federal Way. 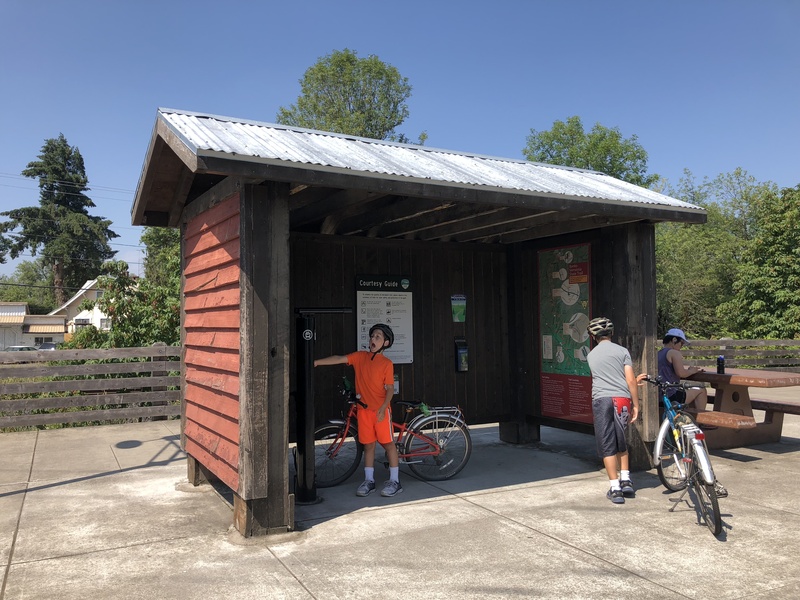 Bike lockers have been on my mind thanks to my last BikePortland column: Family Biking: Taking kids and bikes on MAX light rail and I notice Federal Way TC has bike lockers. They seem expensive, but you already have a locker card, stowing bikes full of camping gear in one and then hitting the mall for lunch and window shopping could work. The mall is surrounded by busy roads with no bike markings of any sort so I opted to skirt around it on the wide sidewalk. It might be more fun to cut through the parking lot, depending on time of day. For a Friday evening I figured I was better off on the sidewalk, which had no one walking on it anyway. These sorts of sidewalks really seem more like multi-use paths. FYI, it’s legal to bike on the sidewalk here. Happily, a bike lane appeared as soon as I was beyond the mall. I saw several route options in Google maps and opted for the slightly longer one since it utilized a trail, which seemed especially smart for a Friday evening. Car traffic at the start of any weekend, and especially a holiday weekend, can be a little unfriendly. This route was 7.7 miles/50 minutes while the shorter two were 6.2 and 6.4 miles/both 38 minutes. 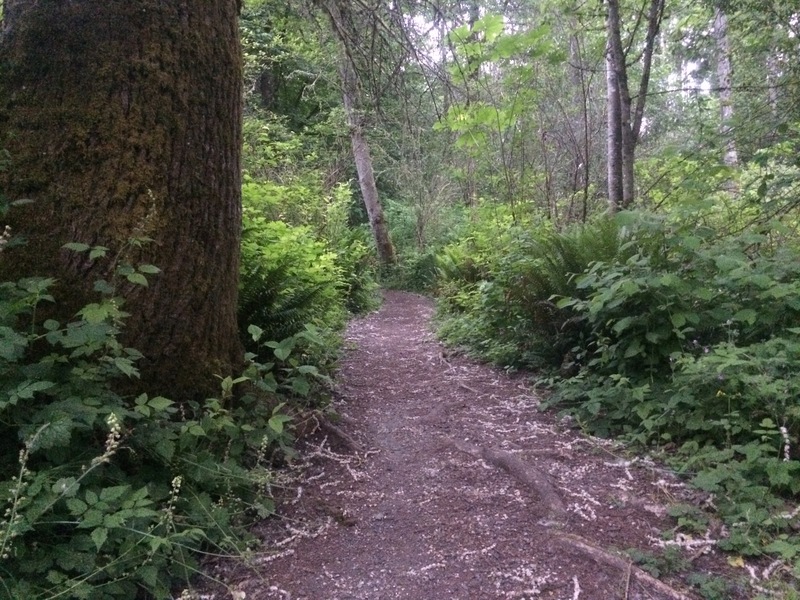 The BPA Trail, named for the Bonneville Power Administration, is something else! I saw so many people on it! In wheelchairs, on skateboards, walking with bags of groceries, walking dogs, on bikes, jogging, bird watching. 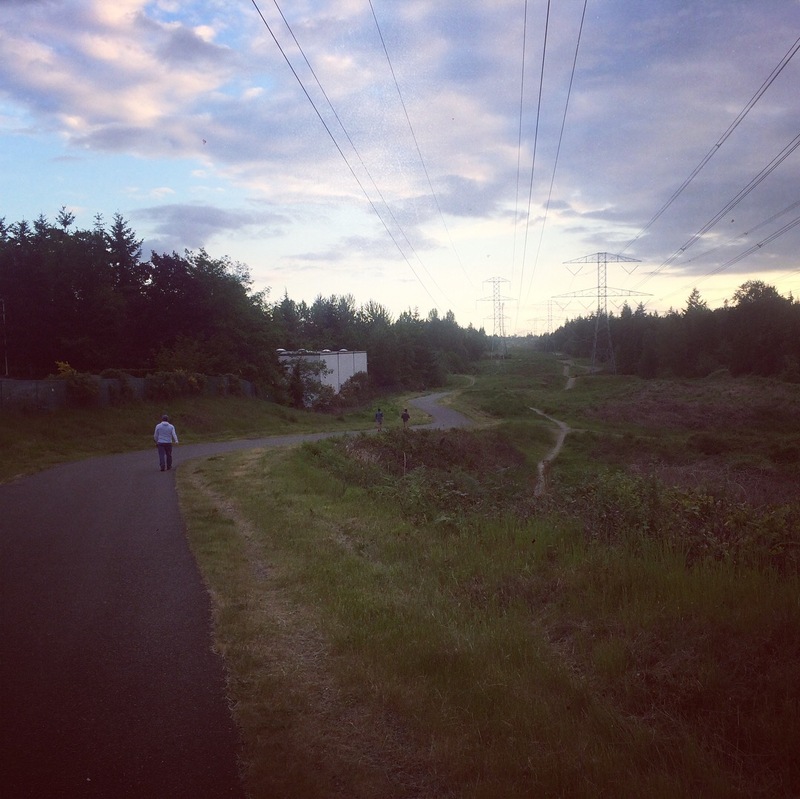 I stuck to the main paved trail, but there are multiple well-used parallel gravel trails. What a gem! 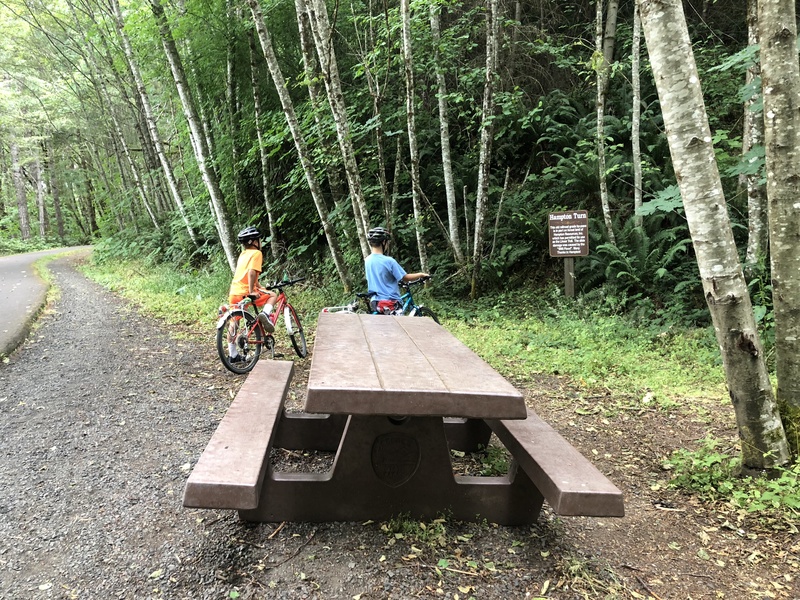 If you have kids who are cool with walking a mile and then hiking, it’d be worth bus here without bikes: The Mountaineers: BPA Trail (“optional, short, dirt side trail goes to a lake in a wildlife refuge” !!! ). The Mountaineers call it “minimal elevation gain,” but I’m pretty sure my kids would consider it very uppy-downy. A couple street crossing were tricky — I had to zoom way in on my saved Ride with GPS route map to figure out the trail continuation and I was thankful it wasn’t dark out yet. Also, some of the bollards at street crossings were a bit of a tight squeeze. On any ride I think about how it could work for any sort of bike and wide cargo bikes would have to be careful in these spots. I love that Google Maps’ bike directions routed me into Dash Point State Park via a trail! I would not have loved this had it been darker, though. As it was, some of the tree canopy made it quite dark, but after dazzling a hiker with my bike light, I turned it off. This is definitely more of a walking path, but there was no “no bikes” sign so slow-moving bikes are OK. I was fine on my road bike with 25mm slick tires, even with some tree roots poking out here and there. 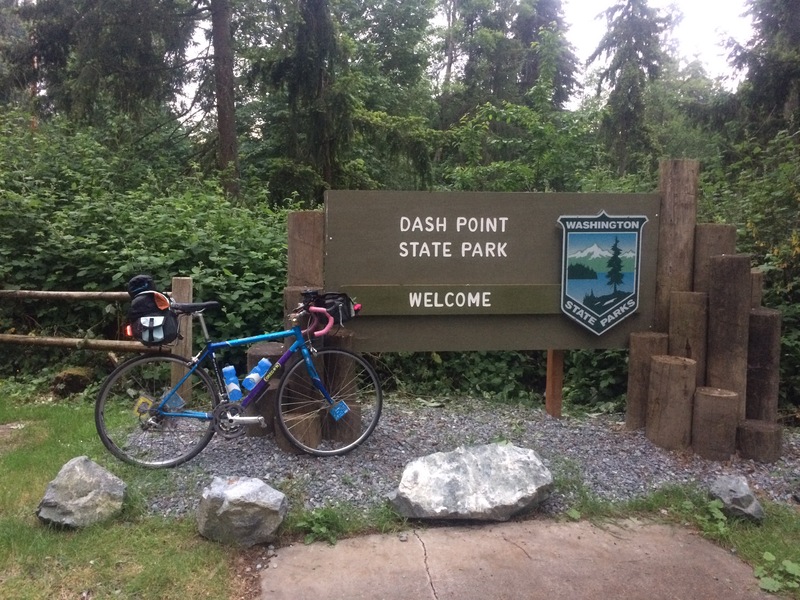 Dash Point State Park doesn’t have hiker/biker (a.k.a. primitive) sites which are $12 and not reservable, plus I felt safer paying ahead of time so I secured a $25 economy site that looked safely in the middle of everything. Some of the economy sites have space for two tents and the regular sites are only $5 more. 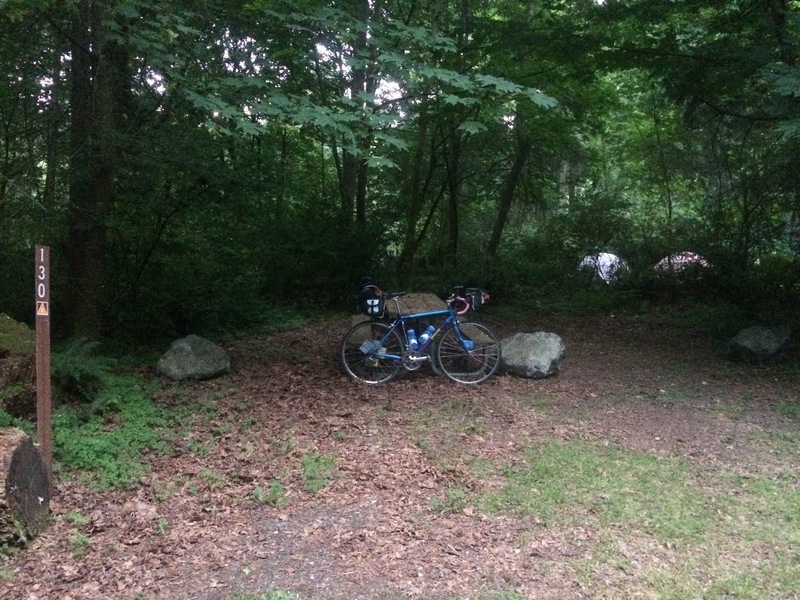 I biked through the whole campground as I looked for my site and loved the look of the place! Large bathrooms with showers and sinks for washing dishes on the outside, a cute campfire area, and cute cabins. The sign near the other (real) entrance to the park said camping was full, and I saw tons of families with little kids, groups of happy teenagers, and even a French camper van. Here’s some more about the park on Outdoor Project and TripAdvisor. I didn’t visit the beach, but I know it’s great and well worth biking down and then back up the hill. Not that I’ve biked to it before, mind you, but when the kids were 2 years old and 3 weeks old and I had a car, I drove there for a day visit with friends. Did I mention Pixie came, too? She was in my backpack the whole time. 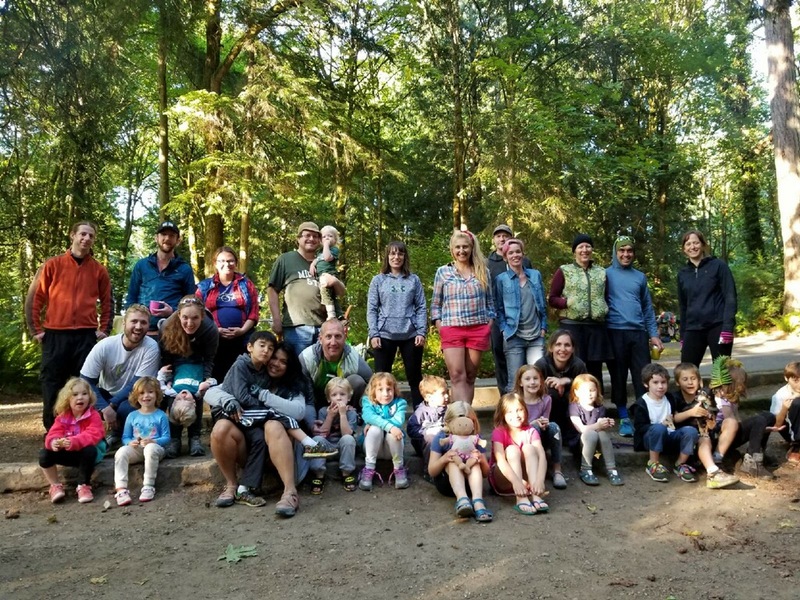 Just a few weeks after our Kidical Mass Bike Travel Weekend group bike camping trip to Illahee State Park we led our annual Fay Bainbridge group bike camping trip for Swift Campout. * Our group numbered 44 humans and two dogs. Six kids were on their own bikes! Each kid-carrying bike carried just one kid (except for mine which carried zero kids). A couple younger sibling babies who aren’t on bikes yet joined us via car. 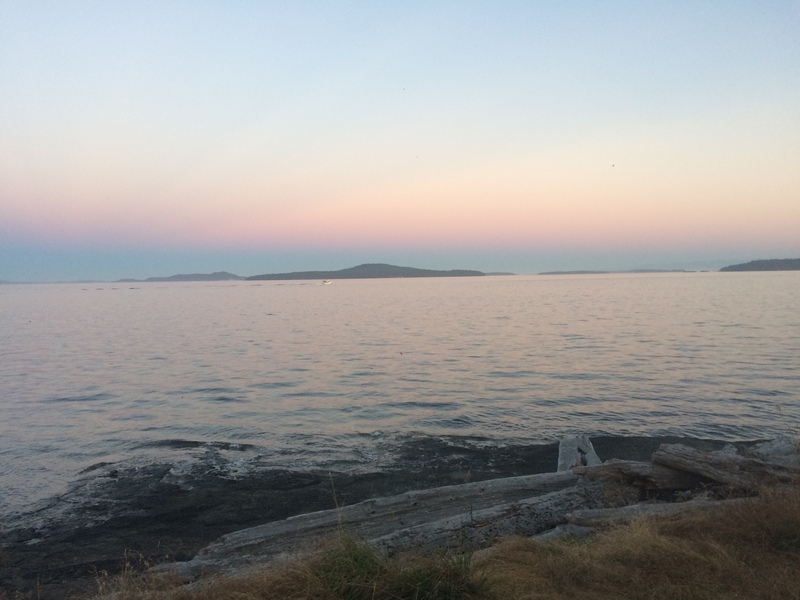 This was our sixth year camping at Fay Bainbridge Park and it was as awesome as always. We’ve done a lot of trips with groups and a lot of trips just the three of us and there’s always something new to learn. Also new this year was a new route. It was kind of in between the two main routes we all use, the flatter highway route (my favorite) and the hillier scenic route. I still can’t decide if it’s the best of both worlds or the worst of both worlds. It’s definitely a third option, though! The route was suggested to us by the Bike Barn Rentals guy as we were waiting on the next ferry to bring some of our campers to us. This wasn’t his original suggestion–that was a bit hillier, though not the same as our regular hilly scenic route. I tried to explain that with 150 pounds of bike and gear I didn’t agree that a couple steep sections could equal a better route. He may not have agreed with me, but he did make some changes to the route. I took this new route on the way back, too, to see if that would help me decide if it was a keeper or not and I still couldn’t decide. I’ve since learned (thanks, Chris!) that looking at the grades of a given route are a good indicator of if I’ll like something or not. In general, I like things less than 6%, so the 6.4% of this new route is also iffy. I’m mostly torn on it because it still contains plenty of highway and plenty of shoulderless side roads, so it’s certainly not all good if you ignore the one big hill. 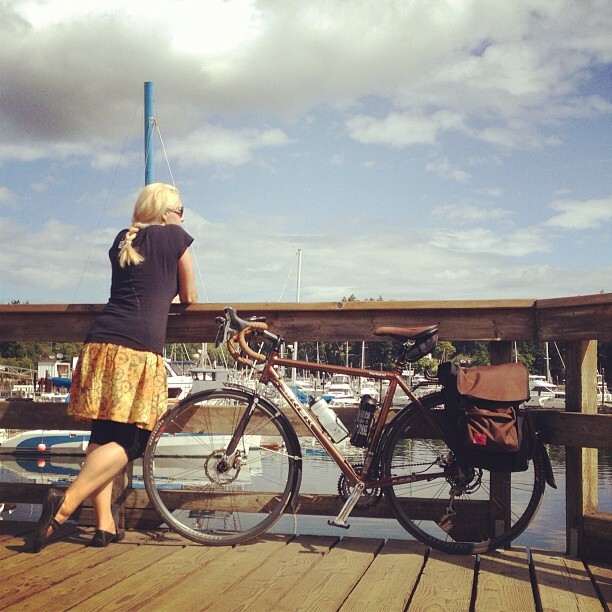 * We biked by the Bainbridge Island Blueberry Co. which has U-pick blueberries! I prefer rushing straight to the campground and settling in, but lots of families do stuff on the way to camp and this would be perfect for that. * The Port Madison Lutheran Church where we turned off Madison Avenue had lots of shade, a water faucet, blackberry bushes, and a play structure! It was a wonderful spot to rest and snack at the five-mile mark (out of 6.3 miles). 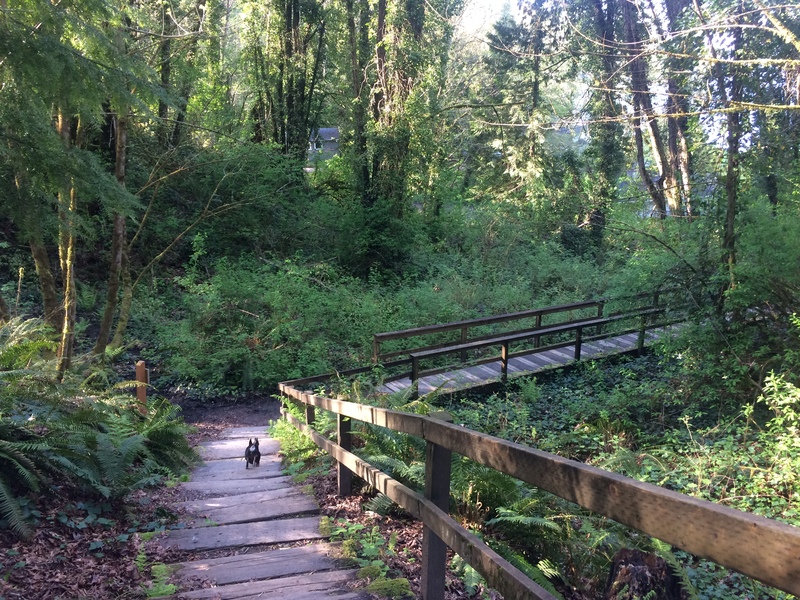 * It was very nice to arrive to Fay Bainbridge Park from the south along a relatively flat section. The big hill (only 5.6% sez Ride with GPS but it feels steeper) at the end of the “flat” highway route is right at the end which makes it that much more unpleasant. It was nice having the three reserved camping spots this year and not having to worry about space. It was also neat having the car parking spots that came with the three sites to allow a few families to do supported bike camping. We’ve been joined by car camping, or partially car camping, families in the past, but they had to find and figure out the car parking those years (though I’ll admit I don’t know if that’s difficult or not, not having car camped at Fay Bainbridge Park myself). 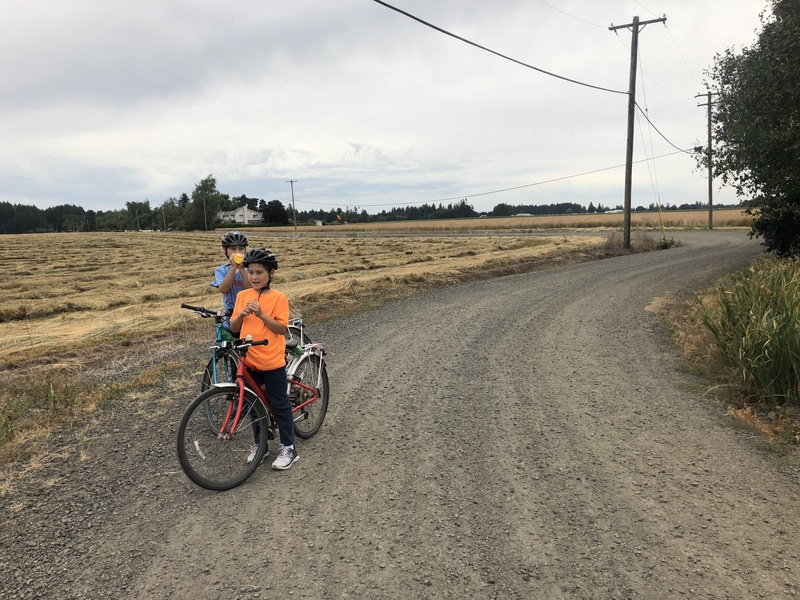 This was my kids’ first time biking to Fay Bainbridge on their own bikes since I was biking with a broken foot. I was extremely impressed with them. 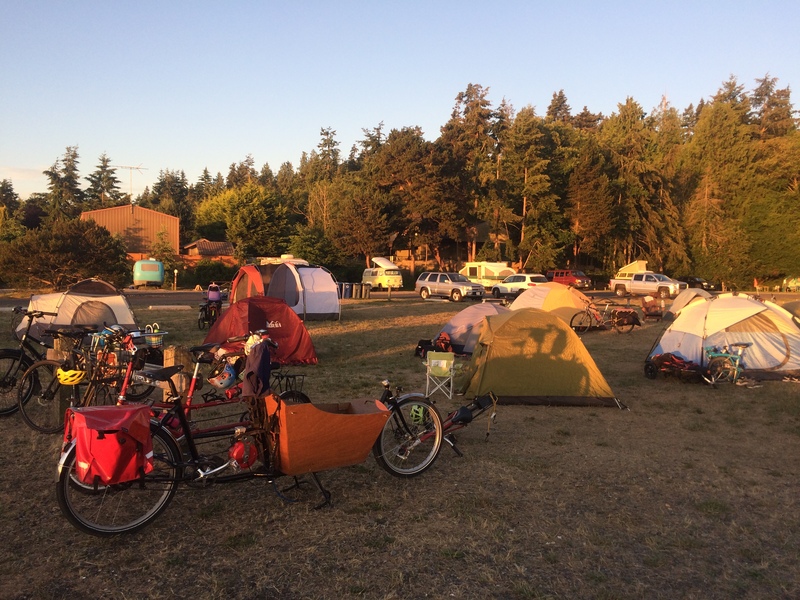 Quite different from last year’s Family bike camping Bike Overnight to Fay Bainbridge with the tandem + trailer bike where I’m pretty sure I was the only pedaler. It was hard for me not to think back on my own trip last year for 2016 Swift Campout to Ipsut Creek with Swift Industries which was one of the biggest rides I’ve ever done and felt so unobtainable in my broken state. I had planned on staying two nights so the kids could play all day Sunday (and I could rest all day) and have energy for riding home Monday morning. It’s always fun to watch the different groups take off when you’re the last to leave. However, after playing all day we all felt done with the beach and with camping so I cooked our dinner for a late lunch and we hit the road. I am so incredibly amazed that my kids made it without complaint! We took our time and met up with friends at the ferry which helped immensely. And we stopped for the spray park on the way home. I’ve been to Salt Spring Island many times, primarily as a kid in the backseat of my family’s car as we trekked our way north from California. 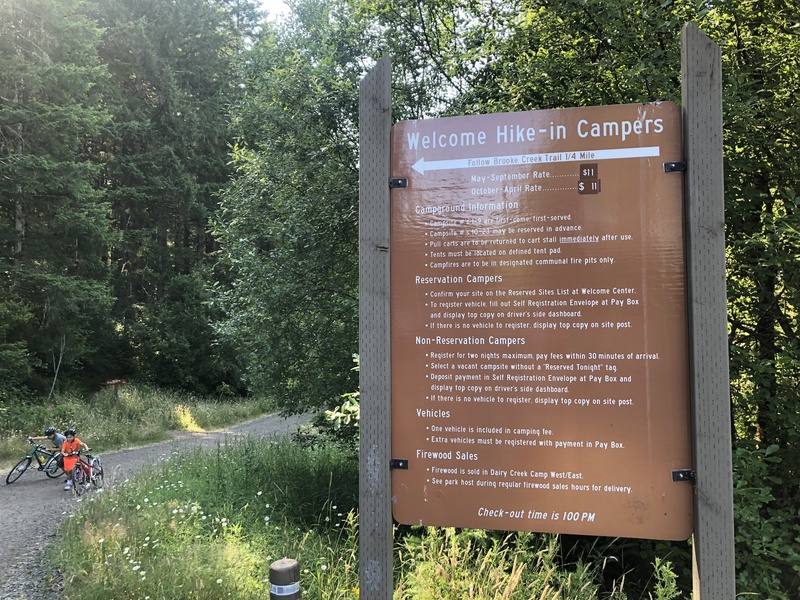 We camped along the way, but once on Salt Spring we always stayed at my aunt and uncle’s house so I’ve never had the pleasure of camping there before now. I have, however, biked there once before: four years ago I borrowed a three-sizes-too-big bike and panniers and left early in the morning for a one-night journey to the island and back. It was quite the whirlwind trip, but very worth it to visit with my aunt and uncle before their health failed. The visits (by car) bringing kids of my own were rewarding, too, of course, but it was nice to have a very focused visit this one time. I started a blog post about that trip, but never finished it. I don’t think I discovered anything that I won’t write about for this new trip other than: consider not doing a big trip on a bike three sizes too big because it might really hurt your back. And wash your old water bottle out well because you can food poison yourself–which is really not fun on top of an aching back. Here’s a photo from that trip. I also learned brown bikes with brown panniers don’t photograph well in woodsy settings. Salt Spring Island, British Columbia, Canada. June, 2013. My friend Velotron joined me and it was awesome to have company this time. It was also awesome to do it on an appropriately-sized bike and with clean water bottles. Unfortunately, Velotron’s commuter bike was out of service so he was on his too-small bike he uses for hauling his cargo trailer. And I think his back was bugging him on account of that. 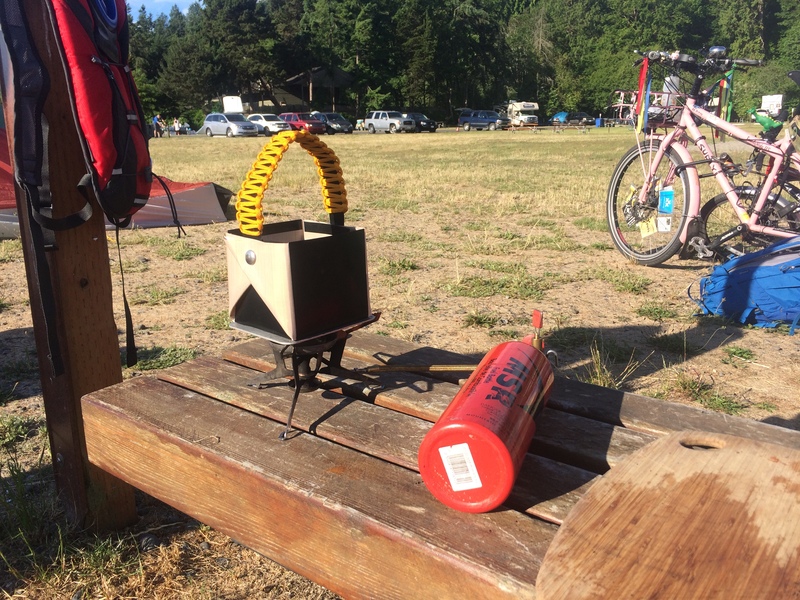 By the way, Velotron is my friend from Bike camping in Iron Horse State Park, take two last year. I had been pretty bummed out we weren’t going to get a chance to do a repeat John Wayne Pioneer Trail trip, but with my broken foot still on the mend, I haven’t been much for planning big trips. I’d certainly call this trip big, but I didn’t need to do planning in the sense of deciding on a destination or date. My aunt died last November and my uncle the year before. This was the weekend of her birthday so on the Friday friends and relatives scattered their ashes at sea (unfortunately I couldn’t make it all the way to the island in time for that) and on Saturday we had a memorial luncheon. I want to interrupt my trip report with a love letter to Ride with GPS. Four years ago I did my routing at home with Google maps and hand wrote turn by turn directions on a piece of paper. It was a nerve-wracking experience, wondering if I’d made the correct turns on the trails of Vancouver Island while racing the clock to catch my second ferry. I still use Google maps as my initial route planner, but if I want to save a route, I use Ride with GPS. 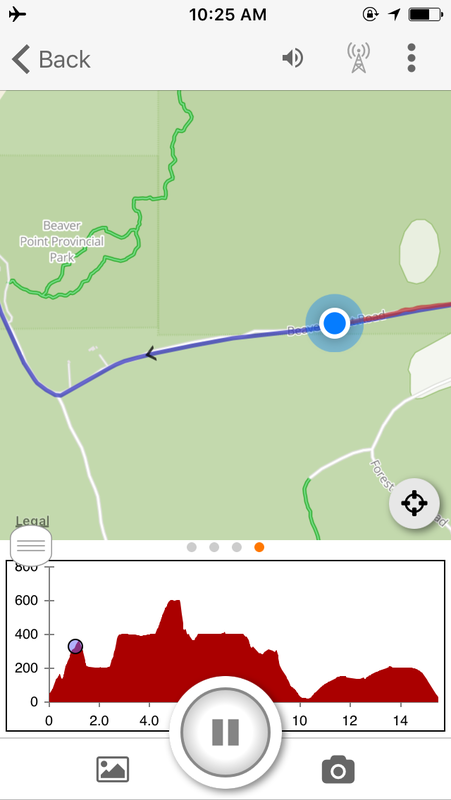 For this trip, I saved eight routes, one for each leg of the trip: Ride with GPS – My Routes. I’m too frugal to invest in an international data plan when I visit Canada so I downloaded the maps of those eight routes for accessing offline. Now what I didn’t realize ahead of time is that even in airplane mode, I could get turn-by-turn navigation! It didn’t occur to me that GPS is independent of internet despite having used my Garmin GPS bike computer to record rides (stored until I’ve found wi-fi and then transferred to my phone via Bluetooth and ported over to my Strava account). So yeah, turn-by-turn navigation! In Canada! Impossible to get lost! Note: I have a Ride with GPS paid Basic account, but you can still do a lot even with the free account: create routes, download routes, and record a ride (I rarely record with Ride with GPS because I’m already used to my Garmin/Strava system for when I want to keep track of things, but I imagine I’ll do more Ride with GPS recording in the future). What the free account doesn’t do is turn-by-turn navigation. And I see the premium account (fancier than my basic account) also gives estimated times. I got estimated times from Google maps and included it in the name field–for example, “Ruckle Provincial Park to Twig and Buoy (1.5 hours)”–but for long field names like that one, I had to click to edit it in order to see all the way to the end of the title on my little phone display. 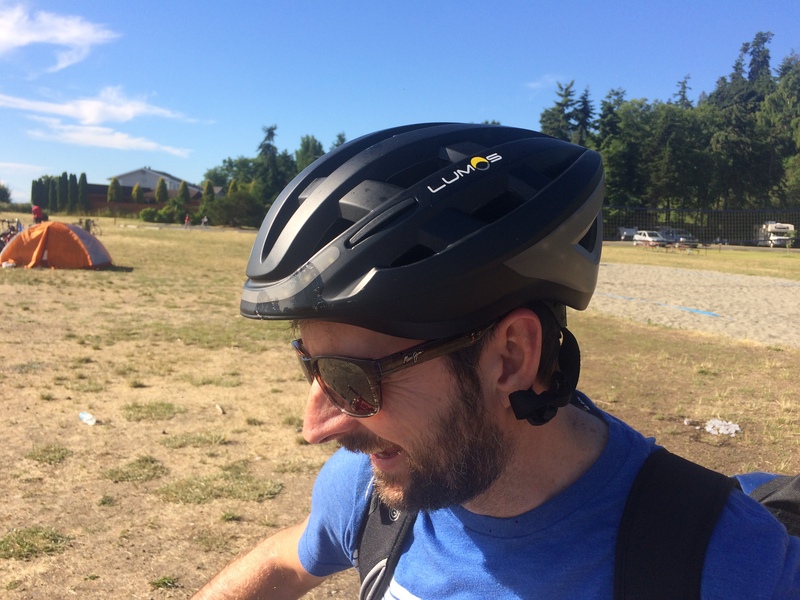 Another note: I had a discount code when purchasing my Ride with GPS account for being a Cascade Bicycle Club Ride Leader. 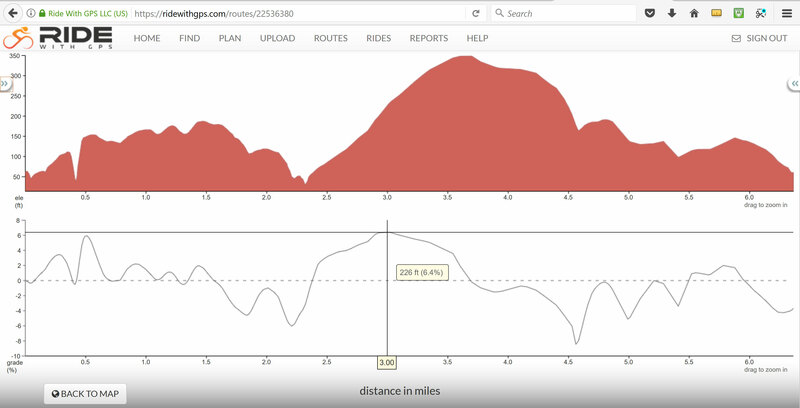 Ooh, and I found the screen with elevation profile! I’m not sure if following my blue dot slowly climb the hill was all that helpful or if I was just punishing myself. Maybe Chris Froome Looking at Stems isn’t missing out on the experience after all, because I still had a great time even as I grunted constant reports about how close we were to the top and what came next. Since I had to bring my kids to summer camp at 9:00 a.m., I couldn’t catch the 7:30 a.m. Victoria Clipper ferry like last time so we took the 3:15 p.m. one. It’s a passenger-only (no cars!) 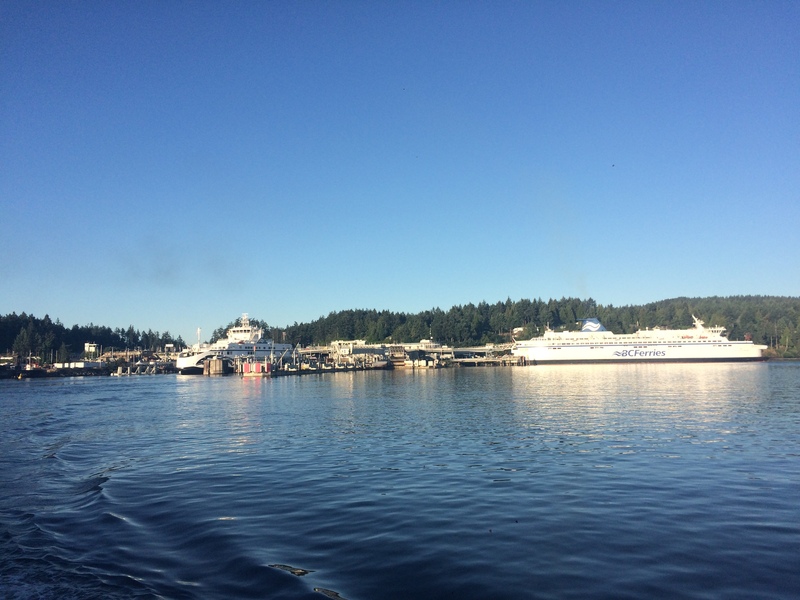 high speed ferry–less than three hours to get from Seattle to Victoria. 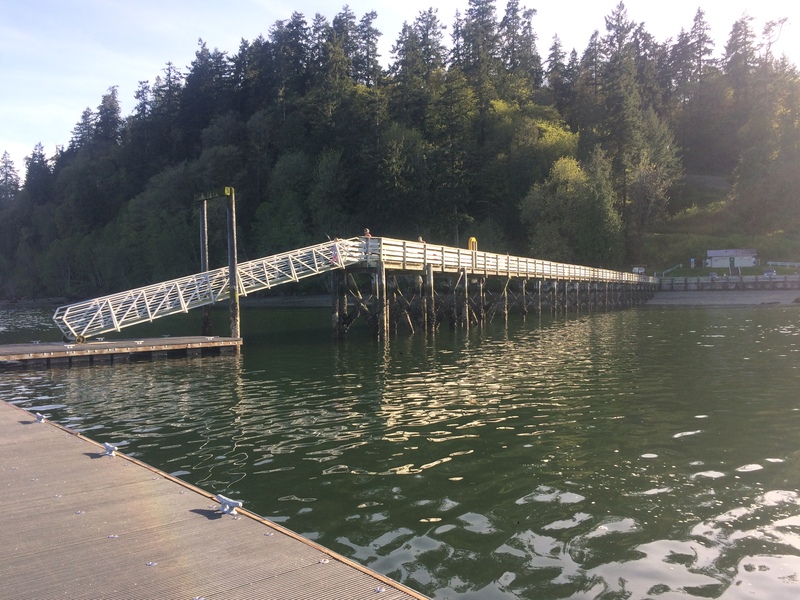 It’s pricier than Washington State Ferries, but it’s so convenient! Bikes are $20 (cargo bikes and tandems are $40) each way and they’re parked outside under a tarp, but still exposed to salt spray so some people don’t bring bikes for that reason. The ferry to Salt Spring Island’s Fulford Harbour leaves form Swartz Bay which is two hours north of Victoria. 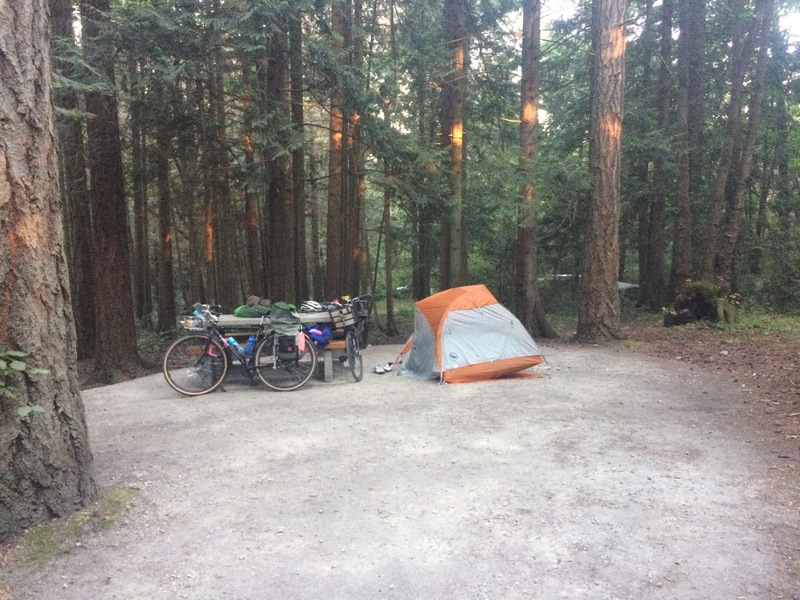 I found a campground right next to Swartz Bay, McDonald Campground – Gulf Islands National Park Reserve, and was able to make a reservation over the phone–$27.20 CAD, $13 of which was the reservation fee. Our boat arrived late and we stopped for dinner in Sidney along the way so it was dark when we arrived. The campground has pit toilets and no running water (that I could see during our very short stay), but the location can’t be beat! We set our alarms for 6:00 a.m. to roll out at 6:30 a.m. for a seven-minute ride to the ferry terminal and catch the 7:00 a.m. ferry to Salt Spring Island. I couldn’t reserve a campsite at Ruckle Provincial Park ahead of time. There are only 10 reservable spots and 68 first-come, first-served spots. I called and was told they don’t turn bikes away so even if we couldn’t find a spot, we’d be OK.
UPDATE: We met a couple on bikes on our return ferry who had been turned away! They said there’s a new guy at the park who turns bikes away if it’s full. They found a place to camp in Ganges and paid $24 CAD rather than $20 and had RVs for neighbors. Check out is at 11:00 a.m., but I wanted to try our luck finding a vacated spot at 8:30 a.m. so we could dump our stuff. 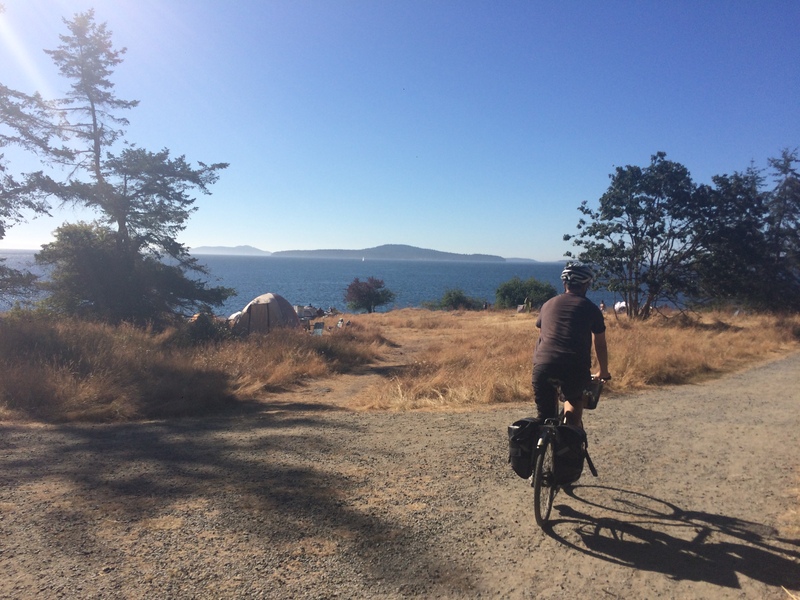 Salt Spring is hilly and I wanted to ride to lunch and back without camping gear. We got incredibly lucky and scored an empty site right on the water. Ruckle is gorgeous. People who arrive by car have to park in a parking lot and then bring their stuff in with wheelbarrows. So the campsite area is free of cars and despite being packed with tents, doesn’t feel overly crowded. A gravel trail runs through the campground and to get to our waterfront site, we had to follow a narrow trail through a couple other sites. I was worried about finding our way if we returned after dark, but it was still light when we got back. Lunch was in Fernwood, 15.5 miles from Ruckle and our biggest leg on the island. It was hot and hilly, but we made it with some time to spare before noon. I was too tired to do any exploring of the small village, but just beyond Twig & Buoy was the water. Our route to and from Fernwood took us past St. Mary Lake and I wish we’d brought suits for a quick swim after lunch. Instead we biked straight to Ganges, the biggest village on the island. We had an hour to kill before dinner with my dad so I lazed in Centennial Park while Velotron explored. The Saturday Market had just closed up for the day, but it was still packed in the park and all over the village. Then despite needing to search around for a dinner place with seating, we were done eating and back to Ruckle before the sun was down. Have I mentioned Salt Spring is hilly? I was exhausted and fell asleep before anyone else in the park. Sunday was structured around us being back to Victoria in time for the 7:00 p.m. ferry. So as not to be rushed, we met my dad for breakfast at Rock Salt by the Fulford Harbour ferry at 10:00 a.m. and took the 11:50 a.m. sailing. 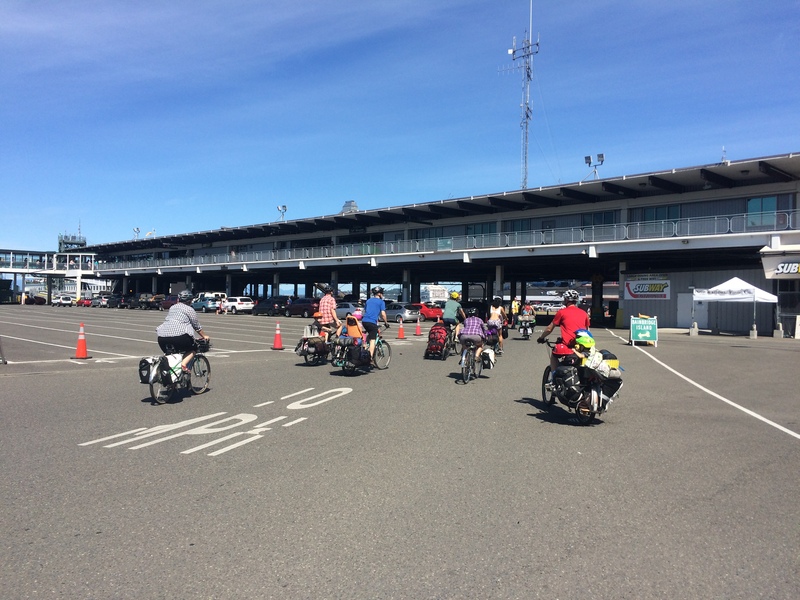 We saw so many more bikes getting off and on the ferry as we had the previous morning! And then once we were back on Vancouver Island there were bikes everywhere! We kept crossing paths with the same people as we stopped for water, shade, and blackberries and had progressive conversations. The couple that had been turned away from Ruckle warned me off my plan to swim in Beaver Lake due to E. coli the last few years. 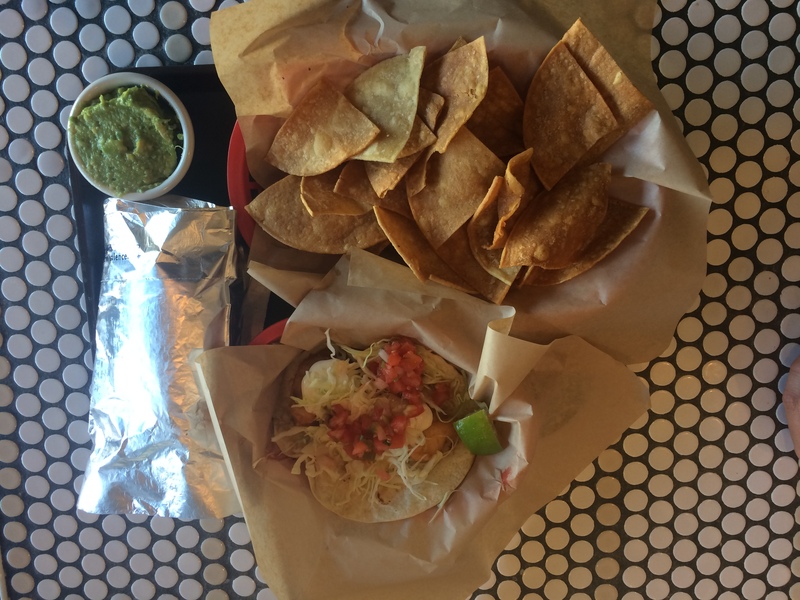 And later they recommended our Victoria lunch spot: Tacofino. And we met the sponsors of the drinking fountain at one of the bike rest stations. We ended up with tons of time in Victoria. So we immediately found ice cream. And then we found Tacofino. I second my ferry friend’s recommendation. After lunch we found a shady spot near the Clipper terminal and were so early we could watch the Clipper before our Clipper set sail. I don’t think I would have enjoyed rushing to catch that earlier boat and I didn’t have energy to do anything but rest and read, so hanging out in the shade with a view of water taxis, seaplanes, and the MV Coho coming from Port Angeles was just great. 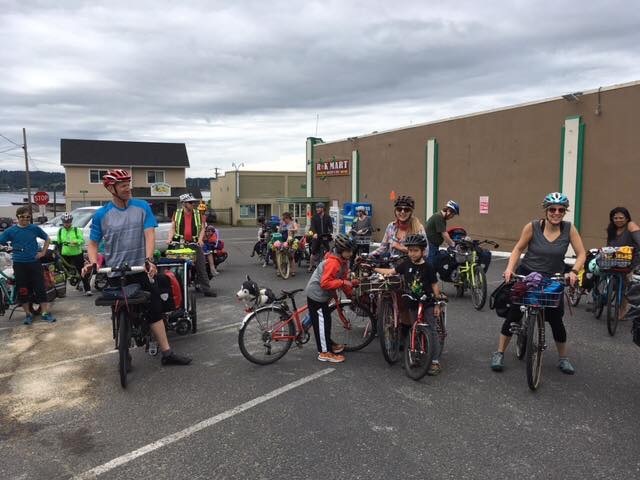 However, Victoria is a blast if you’ve got the energy–the kids and I had a terrific time three years ago: Victoria, BC with family bike and saw a lot of Victoria two years ago during our camping trip at Goldstream Provincial Park Campground: Spring Break 2015 Recap. I’m not sure I’ll visit Salt Spring Island again. It is a beautiful place, but it’s just not the same without my aunt and uncle there now. If you haven’t been yet, though, I highly recommend you check it out. My whirlwind visits were well worth it, but know that one is allowed to camp at Ruckle for up to 14 days. Also, I have a feeling most people bike from Fulford Harbour to Ruckle Provincial Park and then stay put rather than go bike an additional 30+ miles. That seems like it would be pretty nice. 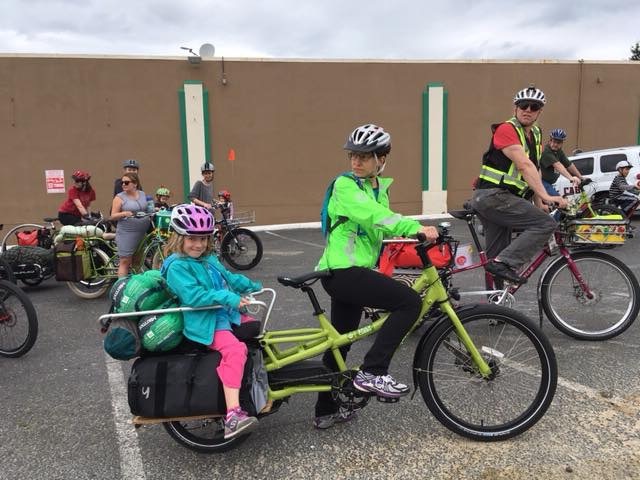 We had a great Kidical Mass camping trip for Adventure Cycling Association’s Bike Travel Weekend! * Our group numbered 35: 16 kids and 19 adults (and one dog). Four kids were on their own bikes! Good eye if you noticed the kids’ bikes all look similar. All four are on Islabikes. They’re light, geared (for 20-inch-wheel sizes and up), and have strong brakes–all great for big hills! It helps that the US factory is close by in Portland, but they ship all over. This was our first time bringing a group to Illahee State Park and it worked very well. All previous (six year’s worth!) 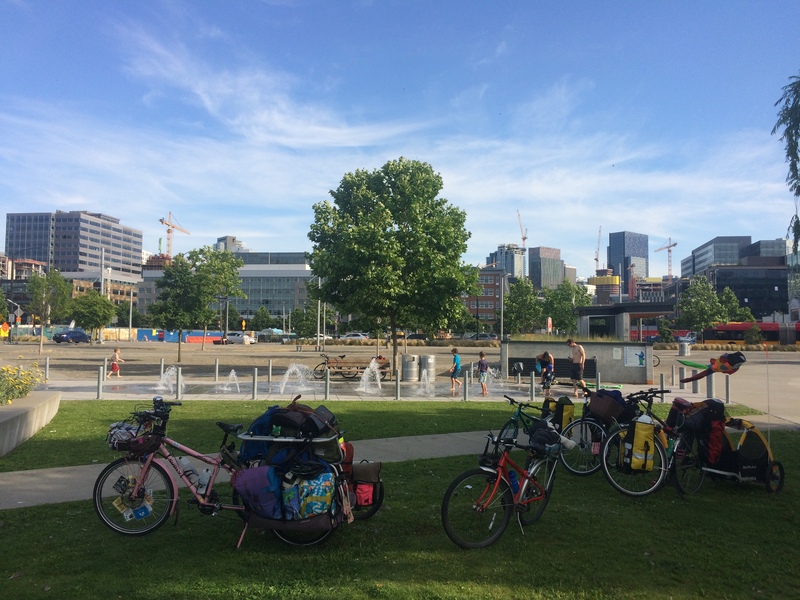 Kidical Mass camping trips, like last year’s Bike Travel Weekend trip, have been to Fay Bainbridge Park. The bike ride to camp from the ferry is shorter–3.7 miles to Fay’s 6.9 miles or 7.1 miles–but it feels hillier to me. I’m not good at comparing elevation profiles so feel free to tell me how hillier (or not) it is down in the comments. Most of our riding was in the street, though with a blocked lane (by a parked car) for the uphill block away from the ferry, I took the wide sidewalk so my kids would follow me there. All in all, it was very calm riding. The Manette Bridge arches up over the Port Washington Narrows and has a bike lane, but I chose to have us ride over on the wide sidewalk. 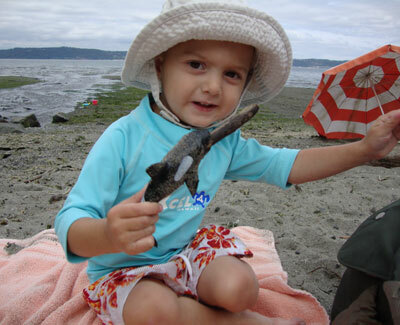 Seattle Kids love Kitsap! 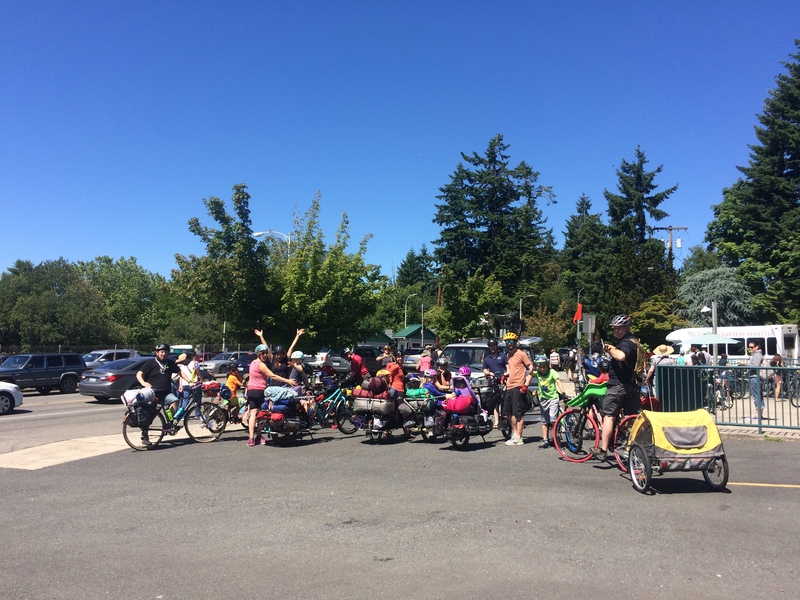 A big group from Kidical Mass is on a weekend cycling adventure to Illahee State Park. We spotted them crossing the Manette Bridge and snapped a few photos. Thanks to Madi Carlson of Wallingford for arranging the party! I reserved three sites (11, 12, and 13) ahead of time–spacious sites I chose during a test run. Upon arrival a few families added adjacent site 16 to our batch and we all fit quite well. It’s not the same as being all in the big clearing of Fay Bainbridge Park, but it was amazing being amid the trees. Most of our campers made the trek down to the beach. It’s a great half-mile hike starting just across the street from the group picnic shelter parking lot. 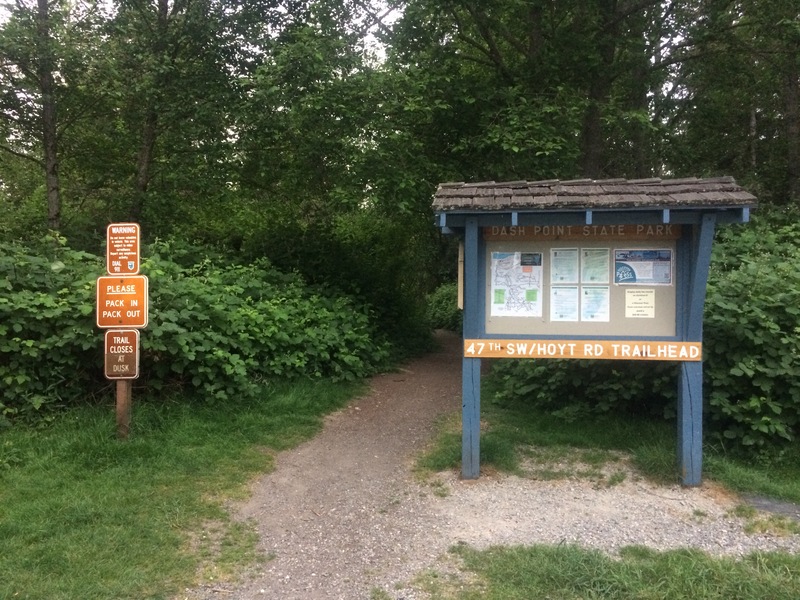 The trail ends with a street crossing to the beach parking lot–something to keep in mind for little hikers who run ahead. The swings and teeter totter have been removed from the playground, but the slide is still there and the kids seemed satisfied. A new playground is coming at some point. During our stay we saw volunteers clearing the fallen tree that crushed the group picnic shelter this winter. 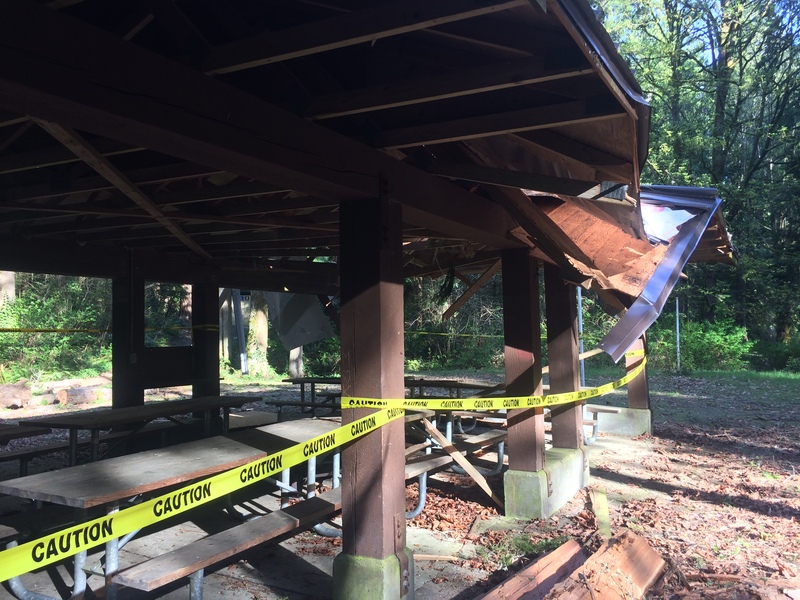 The picnic shelter would normally have been a terrific place for charging of e-bike batteries and will be an option again next summer. 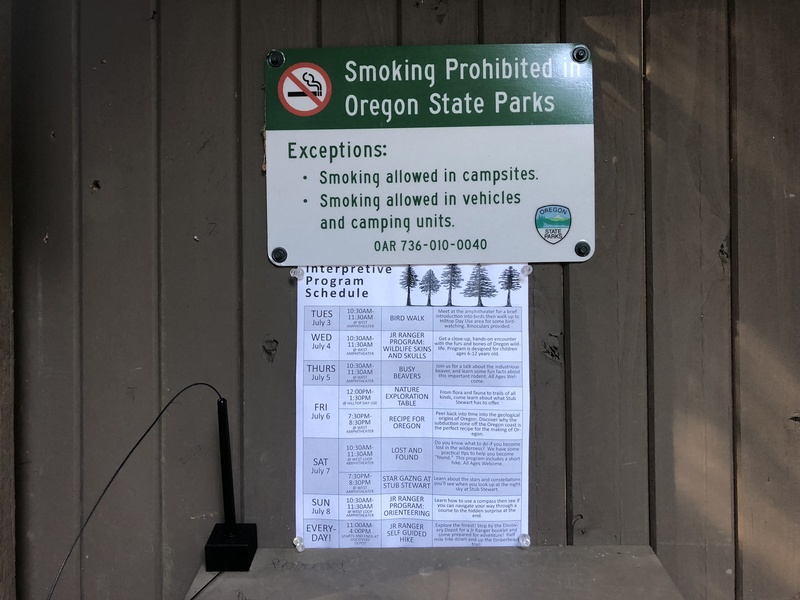 As it was, e-people had to make do with the outlets in the bathrooms–there’s one at the campground and one down at the beach. Everyone was pretty quick about packing up and heading home Sunday morning. Since my kids were on their own bikes it was pretty important we didn’t stay and play too long lest they become too tired to make it home cheerfully. The very organized campers rolled out around 9am and caught the 9:45am ferry. the rest of us set out for the 11:10am ferry. Even with a stop at Saboteur Bakery in Manette (recommended to us by Patty of Visit Kitsap) the families not stopping for lunch grabbed the 11:10am boat while 11 of us stopped just above the ferry terminal for lunch and caught the 12:20pm. 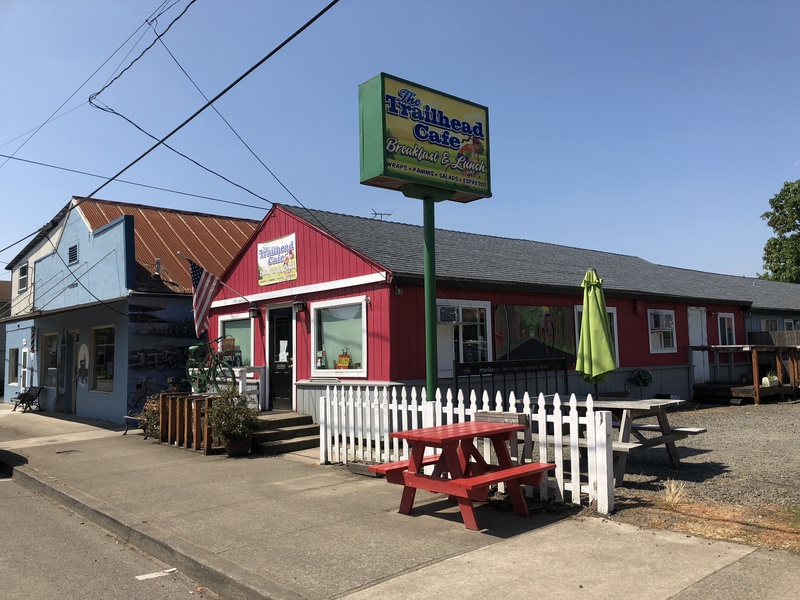 A sandwich shop, European fry house, and quick Mexican food place are all in a row and have outdoor seating for keeping an eye on the bikes and are conducive to wiggly kids. A couple parents crossed the street to get good coffee. I’m so happy with how well the brand new camp spot worked out! We’ll definitely do this again as a group. In the meantime, if you’re a family biker and want to come camping, we’re going again soon: Swift Campout Kidical Mass June 24-25, 2017! This trip will be to Fay Bainbridge. Let’s go camping! 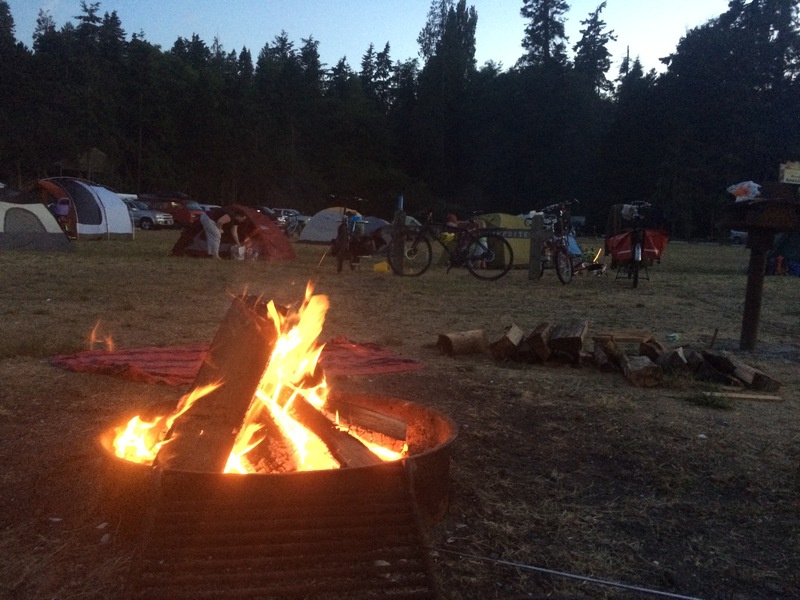 As part of the global phenomenon Swift Campout: Solstice Bike Overnight we’re doing a family bike camping trip Saturday, June 24th through Sunday, June 25th at Fay Bainbridge Park. New this year, I’ve reserved the three sites next to the kayak-in camp area so we can stay in our favorite section without worry of displacing anyone. Register (free) on the Eventbrite event so I can keep track of our numbers and know if we should reserve more sites. Facebookers can RSVP and connect in the comments on the Facebook event page, too. Here’s a recap of a June 2016 family bike camping trip at Fay or go straight to the Flickr gallery of 194 photos. Hiker/biker sites are $7 per person so we’ll plan for $7 per family or tent to cover the cost of the three sites. This will be paid while camping. 9:15 a.m. Saturday, June 24, 2017 – meet outside Fremont PCC Natural Market or earlier if you need last-minute groceries (kids get a free piece of fruit!) or want to go in for potty visits. 11:00 a.m. meet us at the ferry (pay in the kiosk, get in line). 11:25 a.m. Seattle-Bainbridge ferry sets sail (ARRIVE AT LEAST 20 MINUTES EARLY). So arrive by 11:05am. BUT if you’re late, they’ll still put you on–just after the cars load. I love how versatile they are with bikes! But it’s so super fun to roll onto the empty ferry so be early if you’re meeting us there. Plus we can socialize in the bike lane before loading. If you have an Orca card, there is an automated tollbooth at the far right–no waiting behind the cars! But otherwise you need to wait in the rightmost car lane to pay. Current fares are $8.20 for adults, $4.10 for kids six and up, and $1 for bikes (sometimes big bikes cost extra, though I’ve never been charged extra for the cargo bike or tandem + trailer bike). The Bainbridge-to-Seattle direction is free. 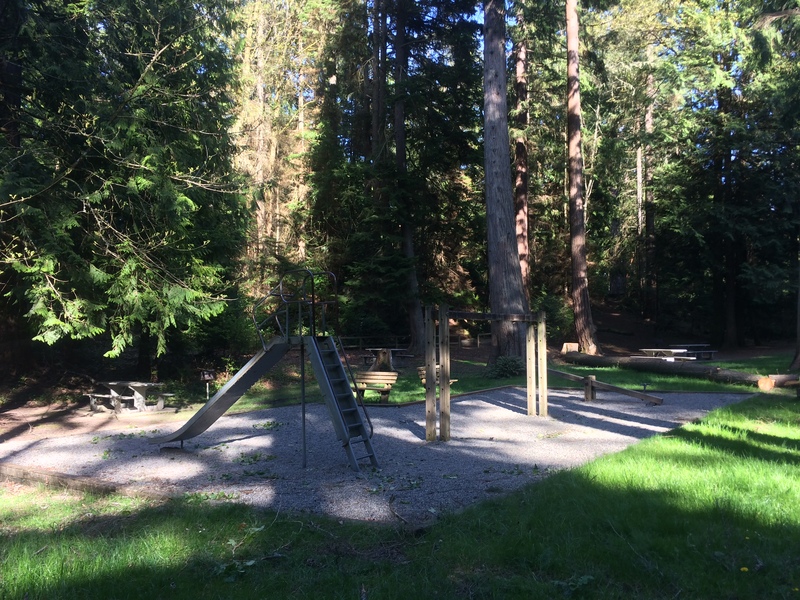 Fay Bainbridge Park features a great playground (!!) and BEACH. 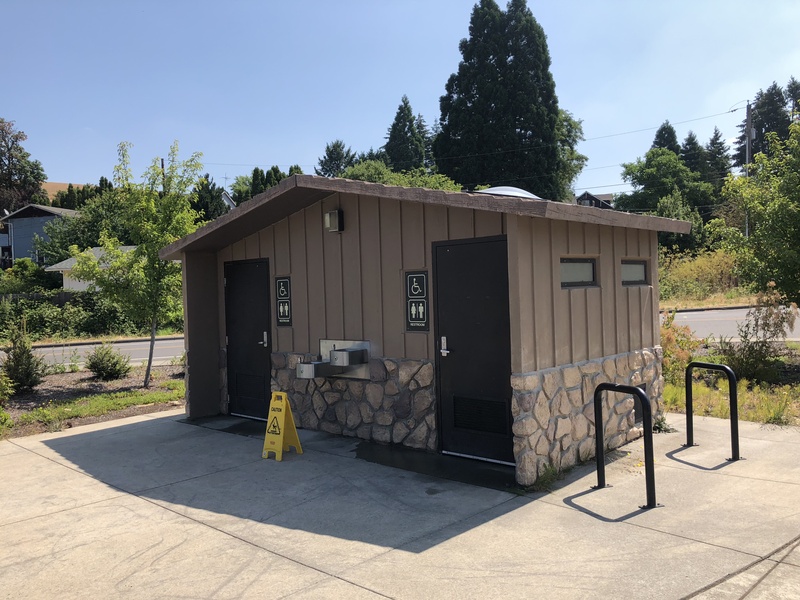 There are outlets in the bathrooms and picnic shelter (which might be reserved) for those who need to charge e-bike batteries or other things. Since we’re paying for three sites with parking spots, that means three cars can come. 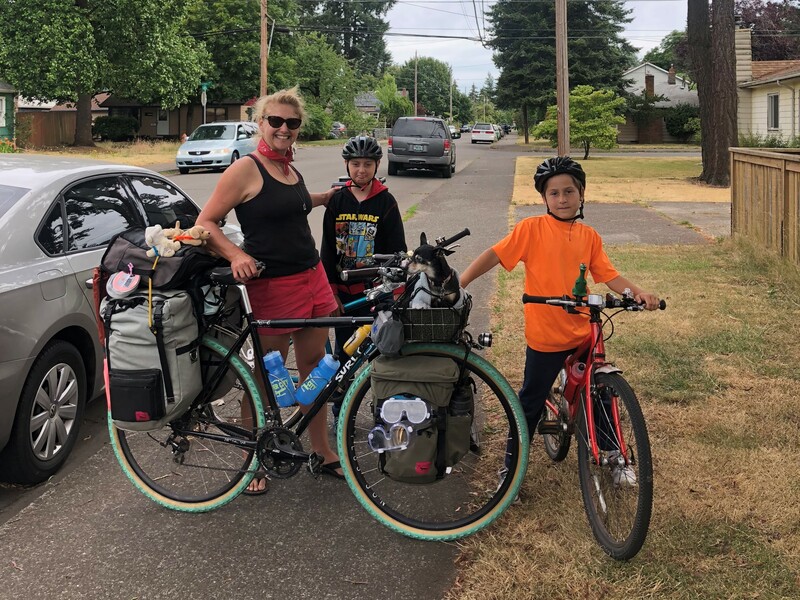 Past trips have see a couple families with various levels of supported bike camping, with half the family on bike and some or all of the gear meeting them via car. Or a van carrying everything. So indicate if you want to nab one of those car parking spots. 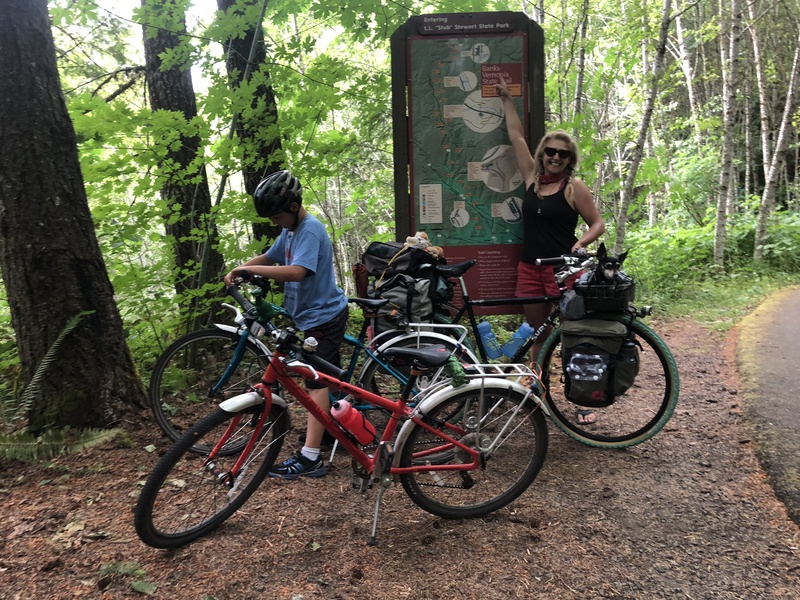 Note: We’ve been doing group summer camping trips to Fay for several years now and we’ve gradually been seeing more kids riding their own bikes–we had four last June! 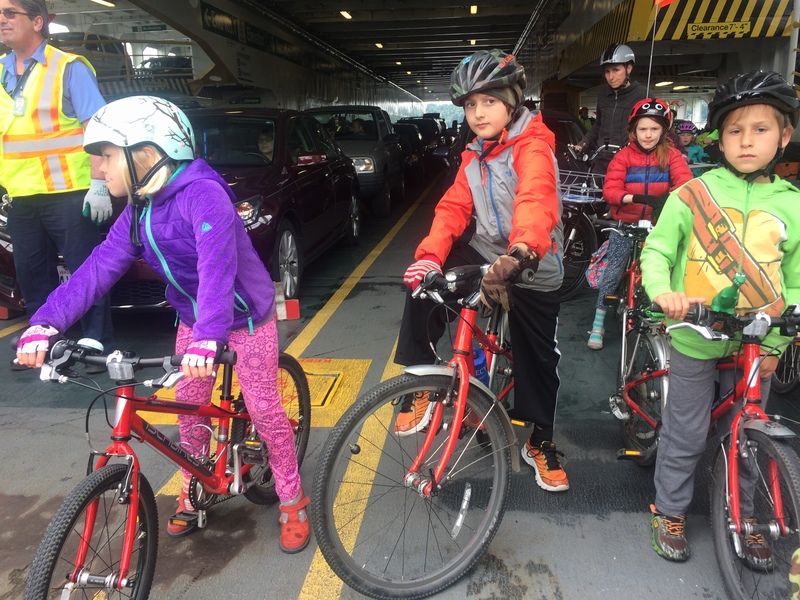 Bainbridge Island is very bikey with drivers used to seeing bikes on the roads, but it’s definitely busier (even the quiet, scenic route) and hillier (even the flat highway route) than my own Seattle kids are used to…however, they’re going to ride their own bikes for the first time this trip! I’ll take my cargo bike just in case I need to carry one or both of them and their bikes for part of the way. At this point no concrete plans for when to head back Sunday. We’ll most likely have an early crowd and a later crowd. I’ll probably be part of the later crowd. We can try to have energy to head to Peddler Brewing Company or Fremont Brewing for a Seattle-side hangout before going our separate ways. 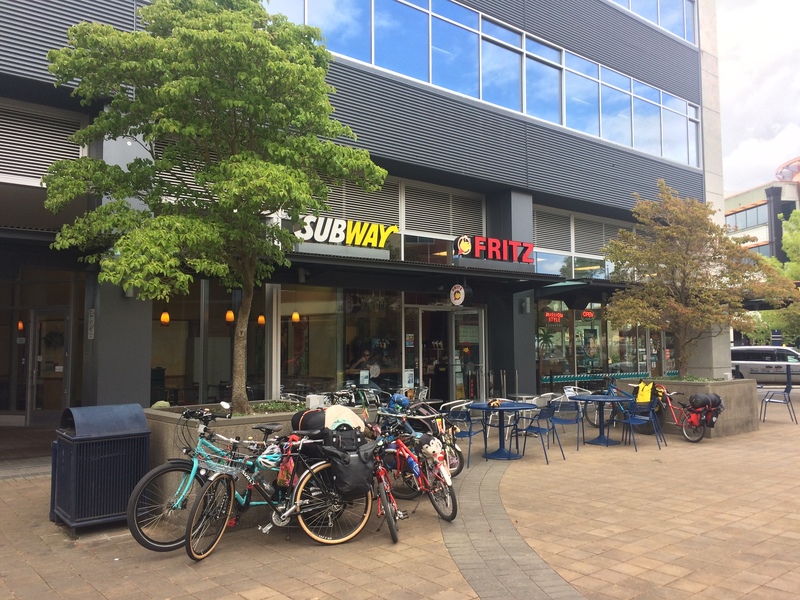 Our route from Fay to the ferry is a backtracking of our Saturday route over and here’s the route from the Seattle Ferry Terminal to Peddler Brewing Company and the route from the Seattle Ferry Terminal to Fremont Brewing. Fay Bainbridge Park has a two-night minimum for reservations so I’ve paid for Sunday night, too. Stay an extra night if you can! We’re bummed about the Seattle Public Schools snow make-up day on Monday or we’d stay, too. New to bike camping or bike camping as a family? Feel free to ask questions in the comments or contact me. 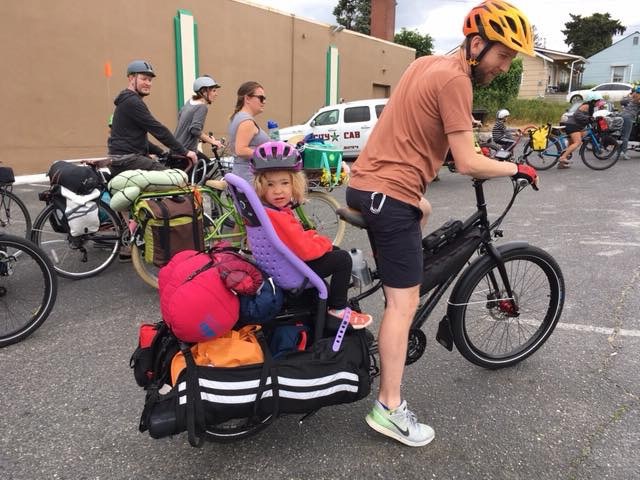 The Seattle Family Biking Facebook group is also an excellent resource–many families have borrowed gear via that group! Do you want to come, but don’t have the right bike? Check out the Familybike Seattle Rental Fleet. Let’s go camping! 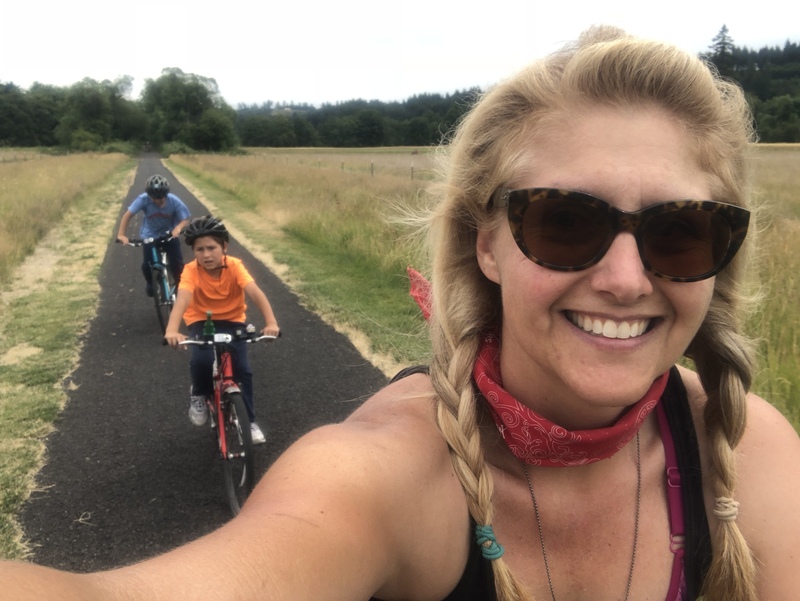 As part of Adventure Cycling Association’s Bike Travel Weekend we’re doing a family bike overnight Saturday, June 3rd through Sunday, June 4th at Illahee State Park. There are only two tiny hiker/biker campsites, so I’ve reserved three big sites for us. 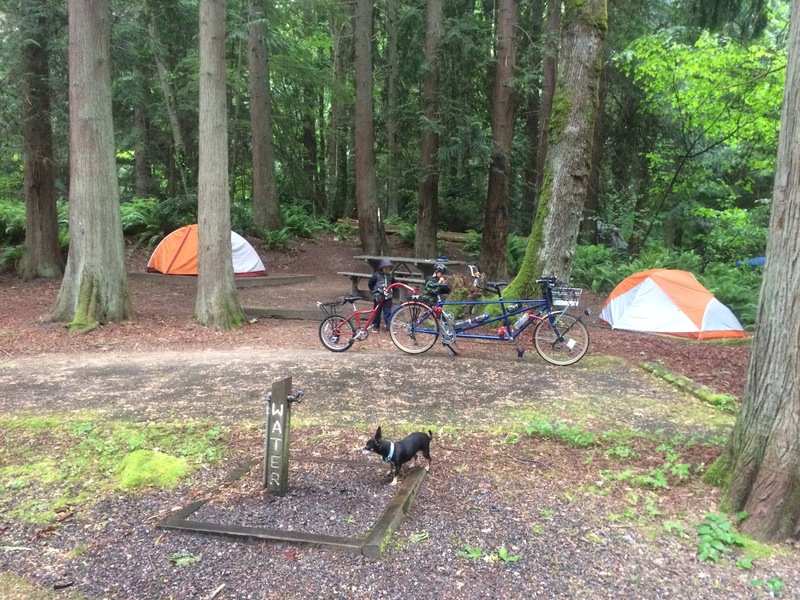 Illahee is new for a Kidical Mass trip, but I’ve camped there a few times without a big group. 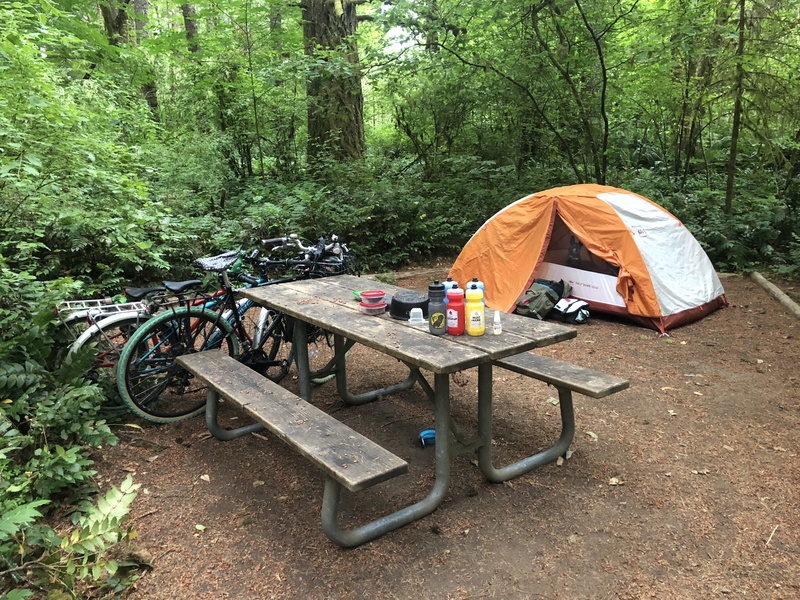 Here’s a write-up with lots of pictures from a camping trip the kids and I took last year: Family bike camping at Illahee State Park. Hiker/biker sites are $12 so we’ll plan for $12 per family to cover the cost of the bigger sites. This will be paid while camping. 8:00 a.m. Saturday, June 3, 2017 – meet outside Fremont PCC Natural Market or earlier if you need last-minute groceries (kids get a free piece of fruit!) or want to go in for potty visits. 9:40 a.m. meet us at the ferry (pay in the kiosk, get in line). 10:00 a.m. Seattle-Bremerton ferry sets sail (ARRIVE AT LEAST 20 MINUTES EARLY). So arrive by 9:40am. BUT if you’re late, they’ll still put you on–just after the cars load. I love how versatile they are with bikes! But it’s so super fun to roll onto the empty ferry so be early if you’re meeting us there. Plus we can socialize in the bike lane before loading. If you have an Orca card, there is an automated tollbooth at the far right–no waiting behind the cars! But otherwise you need to wait in the rightmost car lane to pay. Current fares are $8.20 for adults, $4.10 for kids six and up, and $1 for bikes (sometimes big bikes cost extra, though I’ve never been charged extra for the cargo bike or tandem + trailer bike). The Bremerton-to-Seattle direction is free. Once off the ferry, we’ll ride just over to the right (to the Bremerton Marina/Bremerton Boardwalk) rather than up the hill to congregate while the car traffic clears. Generally, we push directly onward to the campground, but this is when we will discuss if anyone needs to stop at the grocery store or mini mart at the half-way point. Sometimes part of the group stops for a sit-down lunch in town. It’s less than four miles to the campsite, but it’s mostly all uphill, though not steep. 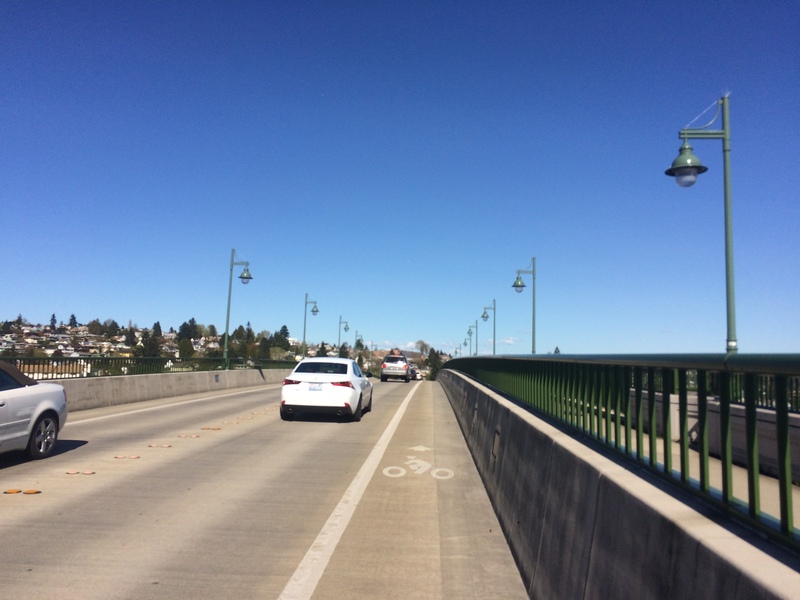 There’s a bike lane on the Manette Bridge, but we will probably want to take the very wide walkway single file. Perry Avenue is a long, uphill slog. We’ll take rest breaks as needed, if needed. It flattens out at the middle school, and taking a break on the grass might be nice. However, I couldn’t locate a drinking fountain when exploring the school so it’s just a rest spot, not a water-filling spot. Winter was not kind to Illahee State Park–several big trees fell and hadn’t been cleared away during my April visit. One crushed the large picnic shelter near the the campground, a spot I formerly thought would be nice for those with e-bikes to charge their batteries. 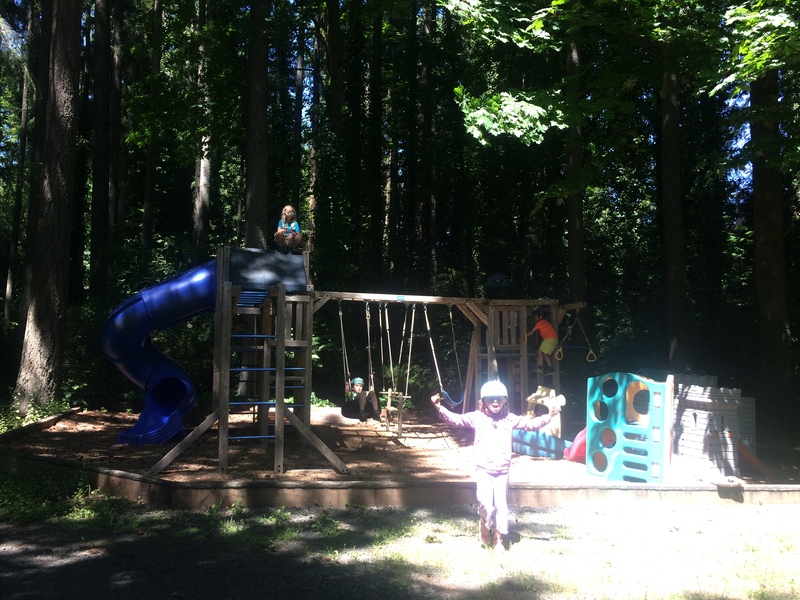 And the swing set was swing-less, but the slide and teeter totter are intact. I’m waiting for a call back from the park to find out if the swings will be replaced and when the picnic shelter will be back. There’s a big playfield attached to the campground (the two hiker/biker sites are against it) and the playground is a one- or two-minute walk. The beach is a fun little hike downhill. 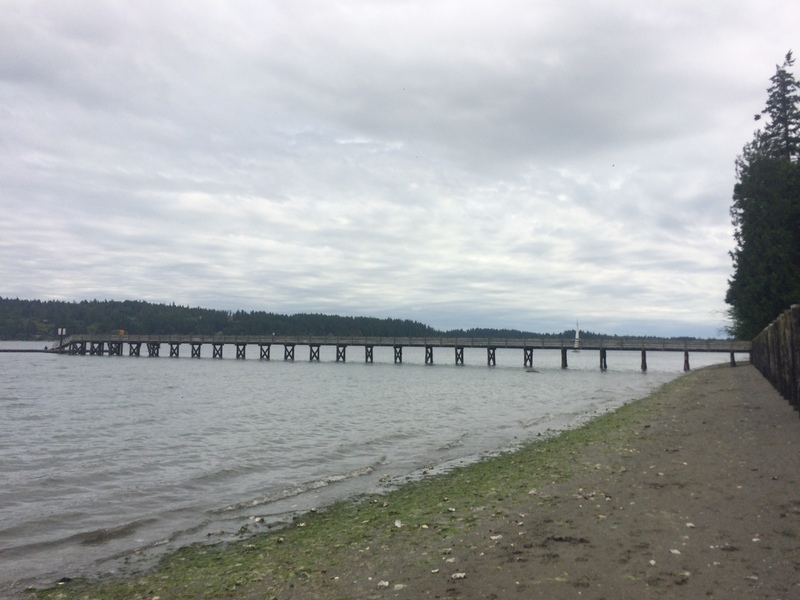 There’s a pier to walk along, a great view of Mount Rainier, and tons of tiny crabs hiding under rocks. The women’s restroom has four outlets…but also a sign to not leave cell phones charging unattended. E-bike batteries are probably safer to leave in there, but perhaps the camp host would let people use the outlet at the camp host site. Showers: Illahee requires paper money (ones or fives) to buy shower tokens. Each dollar buys two tokens that are good for three minutes of hot water each. The token machine is next to the campsite pay station, close to the camp host and restrooms. Since we’re paying for three (or more) sites with parking spots, that means three cars can come. 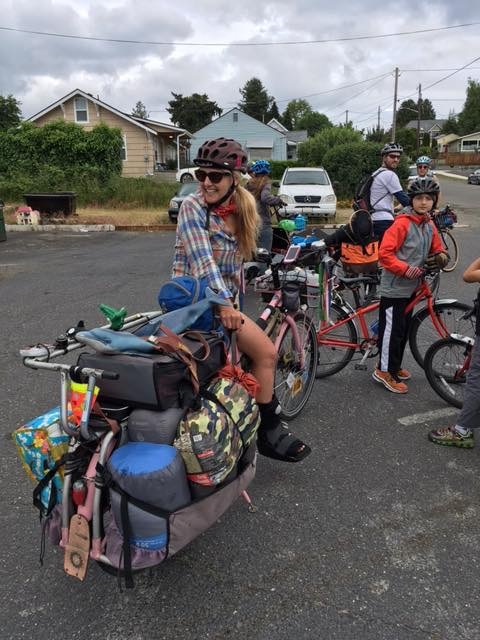 Past trips have see a couple families with various levels of supported bike camping, with half the family on bike and some or all of the gear meeting them via car. Or a van carrying everything. So indicate if you want to nab one of those car parking spots. Don’t forget to look into getting a Discover Pass, I think your car will need one to join us in the park. We’ll decide when to head back home come Sunday. There will likely be an early crowd and a later crowd. I’ll probably be part of the later crowd. The later group will head to Peddler Brewing Company for a Seattle-side hangout before going our separate ways. Our route from Illahee to the ferry is a backtracking of our Saturday route over and here’s the route from the ferry terminal to Peddler. Don’t despair if this weekend doesn’t work! There will also be a Kidical Mass camping trip for Swift Campout June 24-25 and maybe one in August, too. Happy Seventh Birthday, Big Dummy!